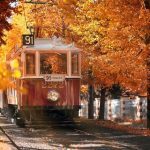 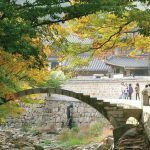 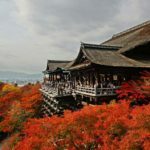 Fall foliage forecast Korea 2018 — Top 16 best places to see autumn fall foliage Korea 2018 - Living + Nomads – Travel tips, Guides, News & Information! 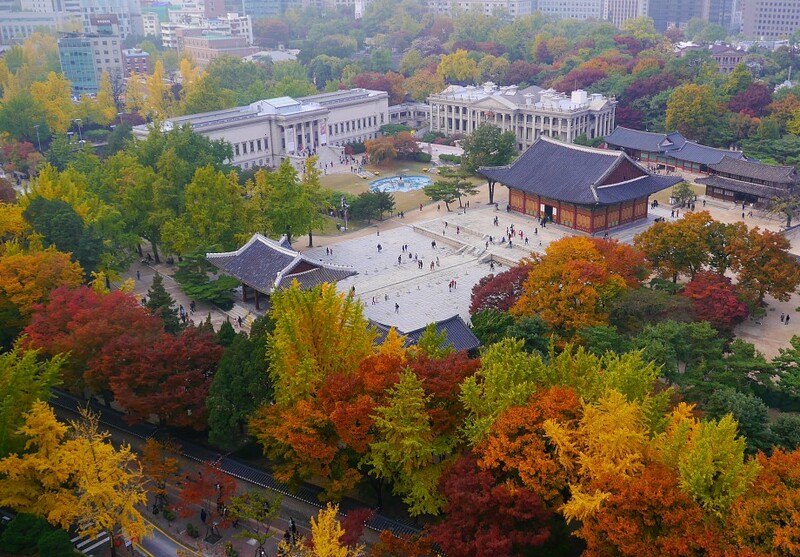 Autumn in Gyeongbokgung Palace, Korea. 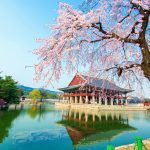 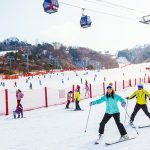 If anyone asks what is the best season to visit South Korea? 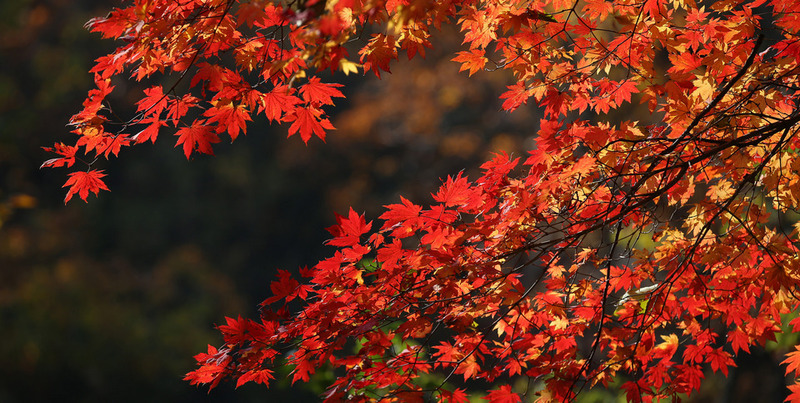 Then, let us say in chorus is the “autumn”. 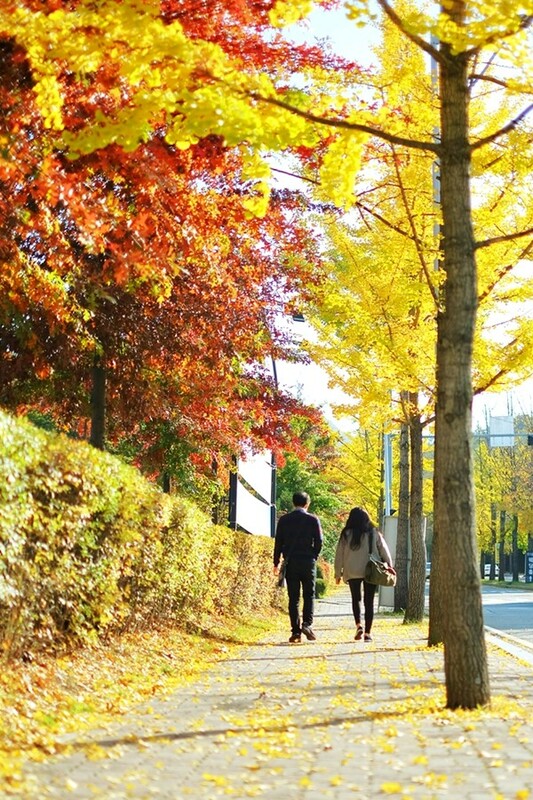 Not hot as summer, wet and humid as spring or very cold like winter, the fall in Korea has the sunshine shimmering, added a bit of Autumnal cold breeze, extremely cool. 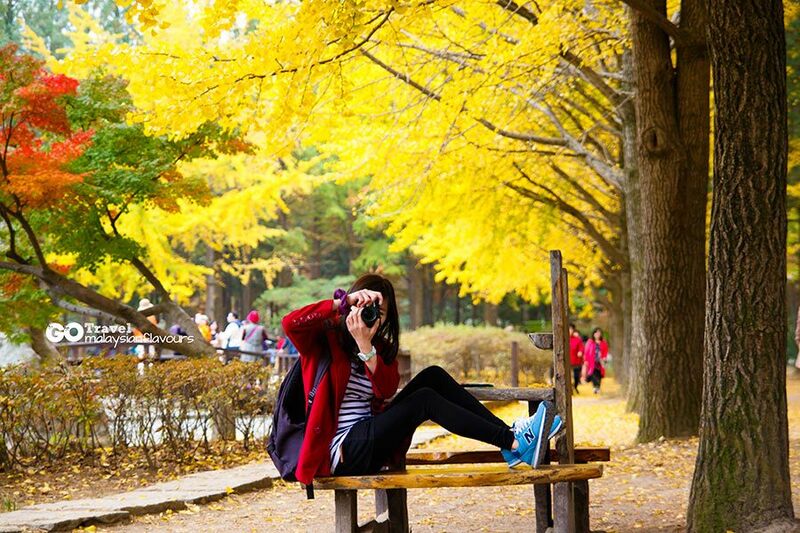 Autumn is the time when most tourists traveling to Korea in the year. 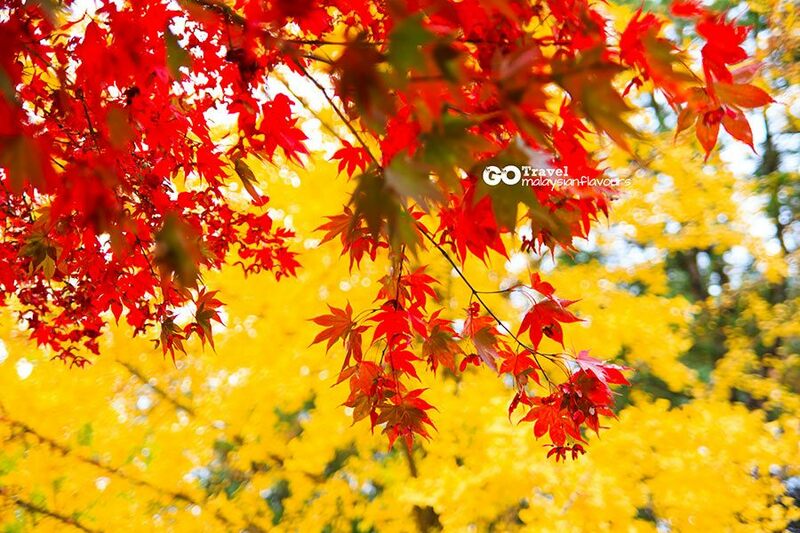 Across the streets, forests, national parks of the land of Kimchi, yellow color of the ginkgo leaves and red color of the maple leaves create a beautiful scene as a picture, very romantic and poetic. 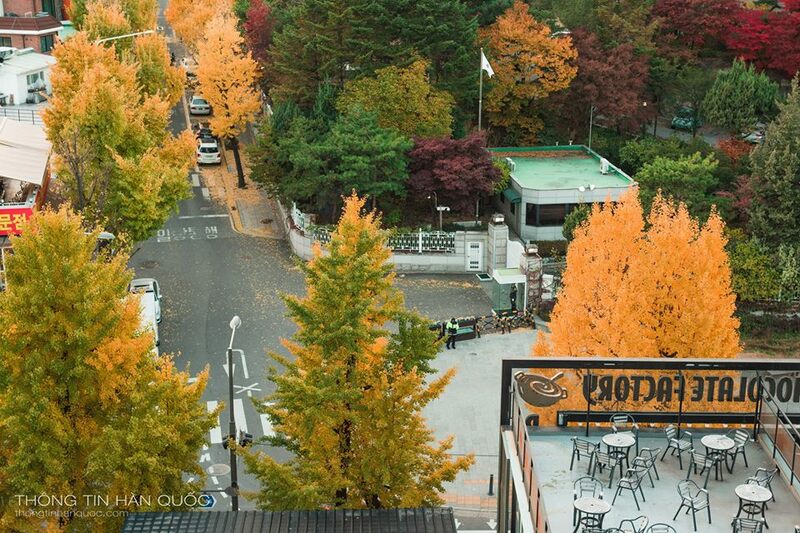 So, when is autumn in korea? 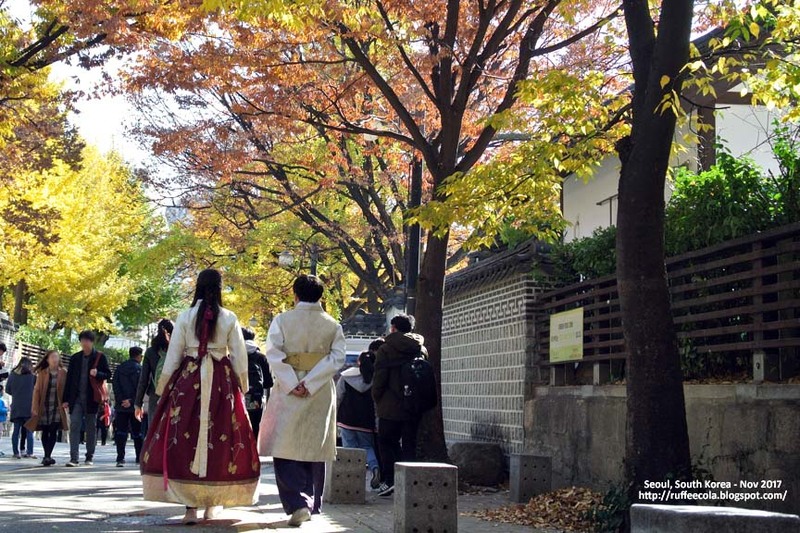 Around the end of October until the first half of November every year is always the best time to visit Korea in autumn to watching the autumn leaves turn color and fall foliage. 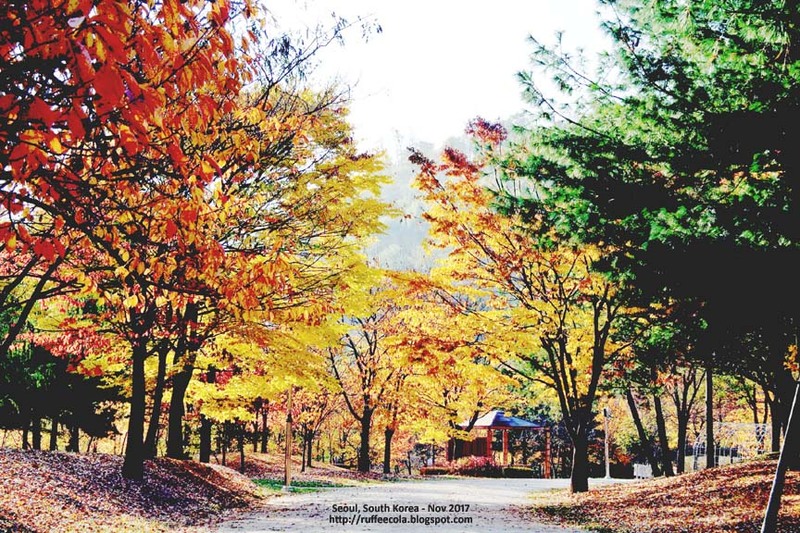 Now, let’s Living Nomads introduces to visitors the fall foliage Korea 2018 (Korea autumn foliage 2018) with the fall foliage forecast Korea 2018 (Korea autumn 2018 forecast, Korea autumn foliage 2018 forecast, Korea fall foliage forecast 2018) and top 9 best places to see fall foliage in Korea below. 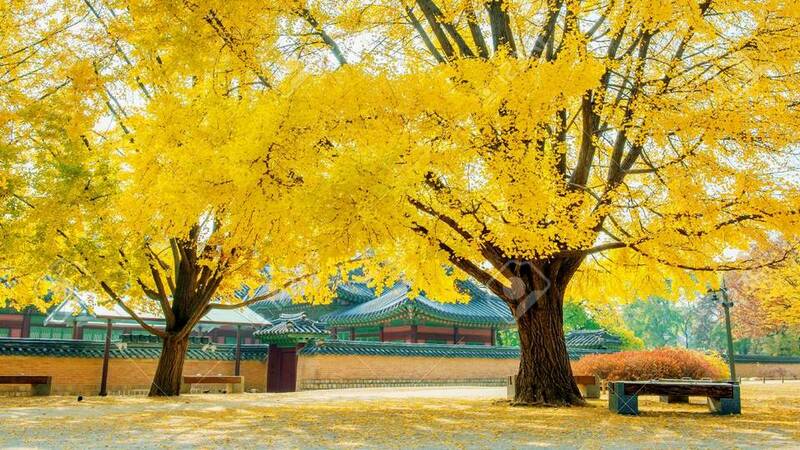 Yellow ginkgo leaves in Gyeongbokgung Palace, South Korea. 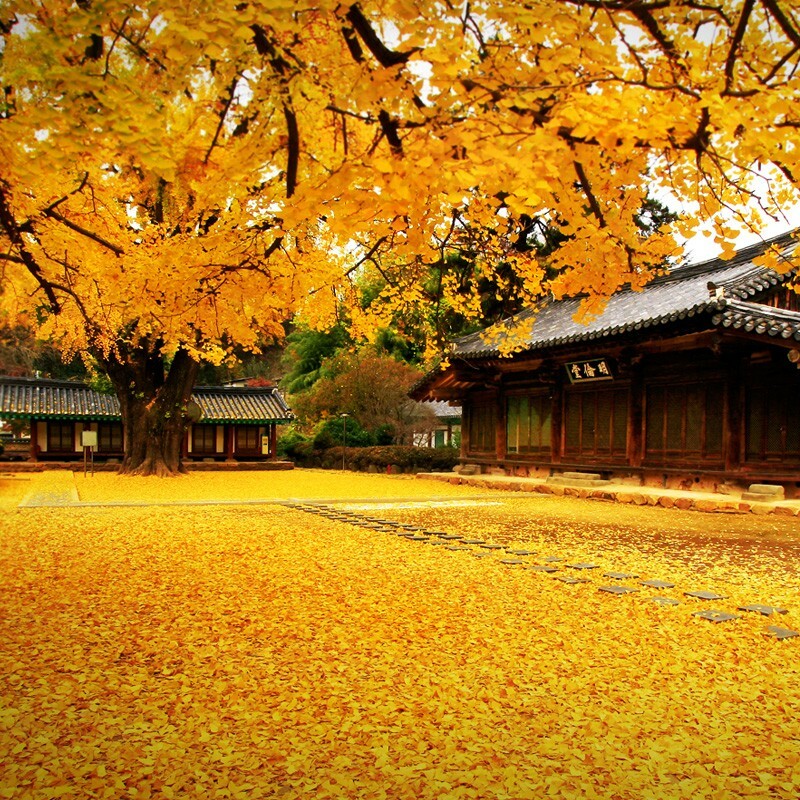 The carpet of gingko leaves at the temple yard. 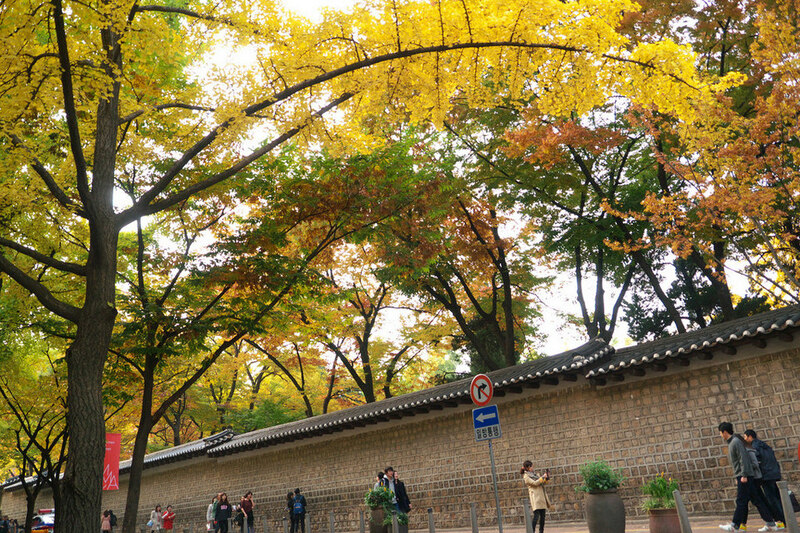 Changdeokgung Palace in Autumn in Korea. 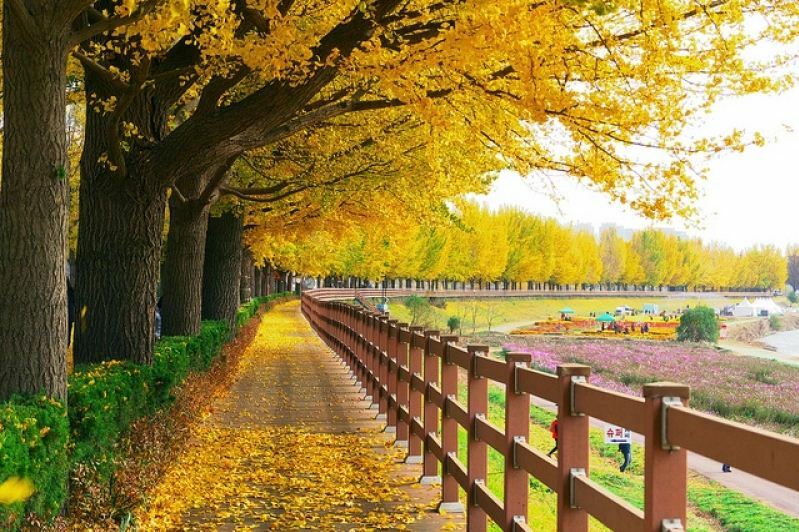 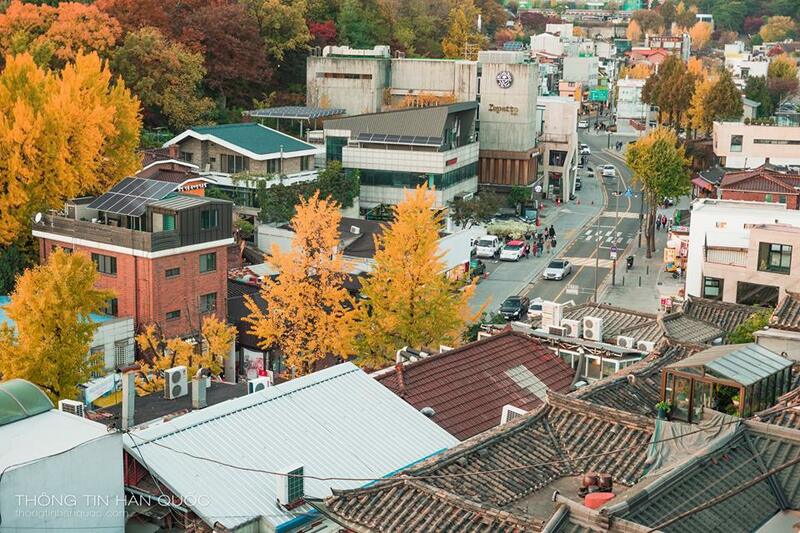 Wiryeseong-gil is a street lined with 1,320 ginkgo trees. 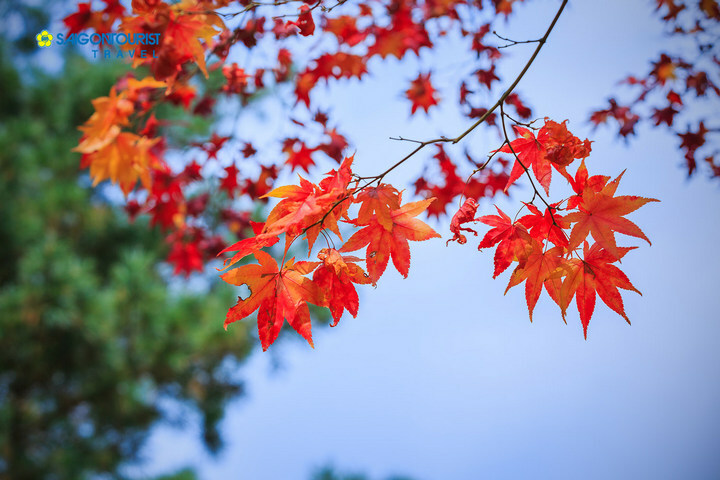 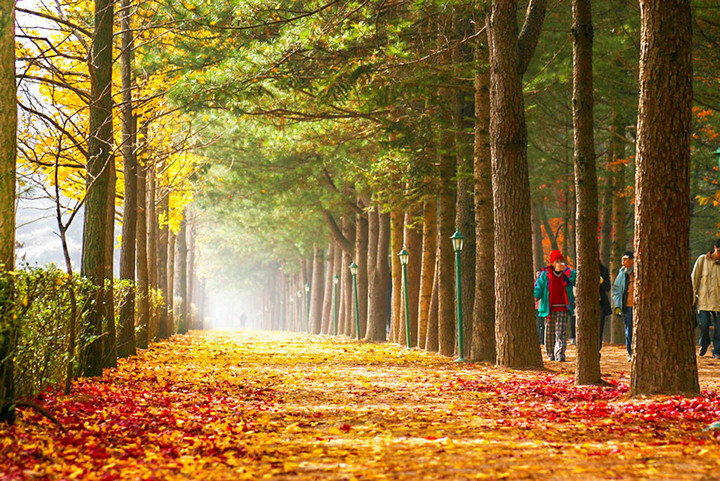 Autumn in Korea lasts from September to November with an average temperature of 20.8 Celsius degrees – 6.9 Celsius degrees, the air is dry and the sky is always blue, warm during the day, the night will be a little cold so it is very suitable for outdoor activities. 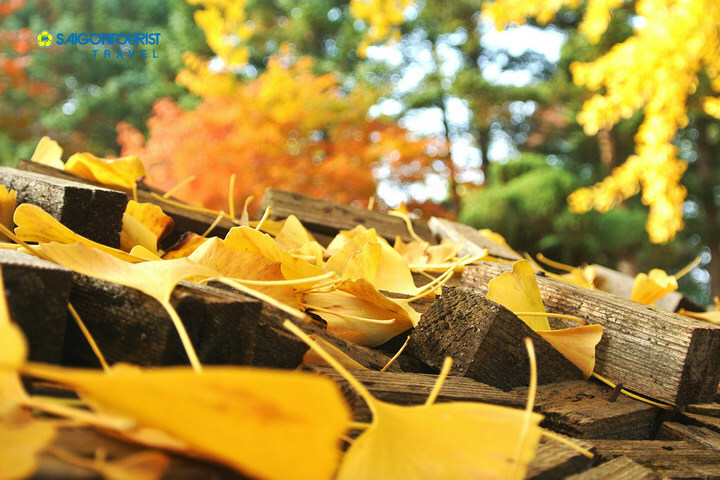 The first appearance of yellow leaves began around the end of September, and peak fall foliage in mid-October. 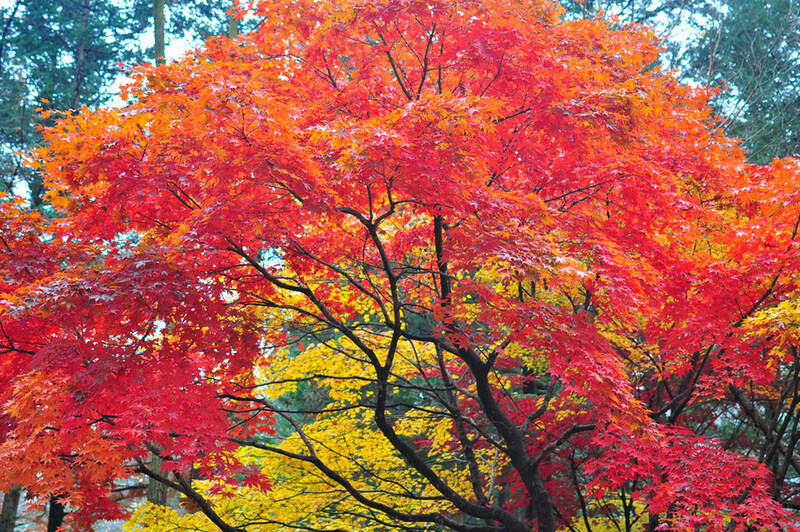 Credit: fall foliage korea 2018 blog. 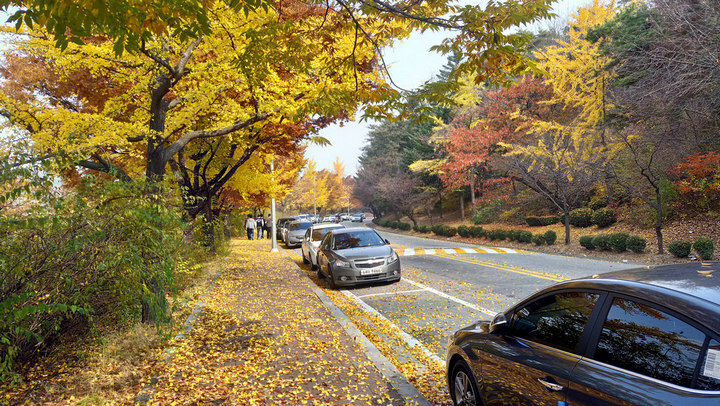 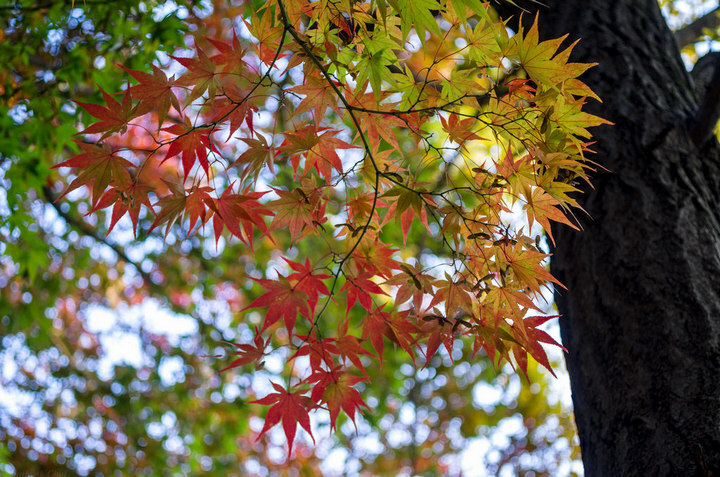 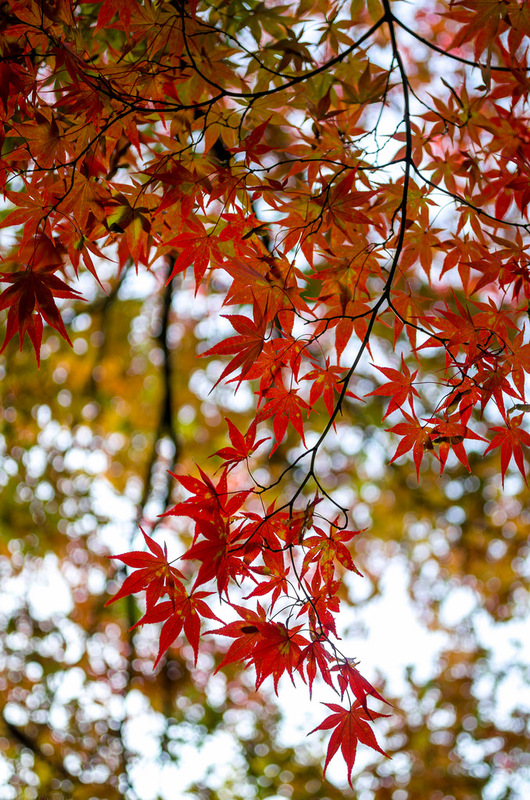 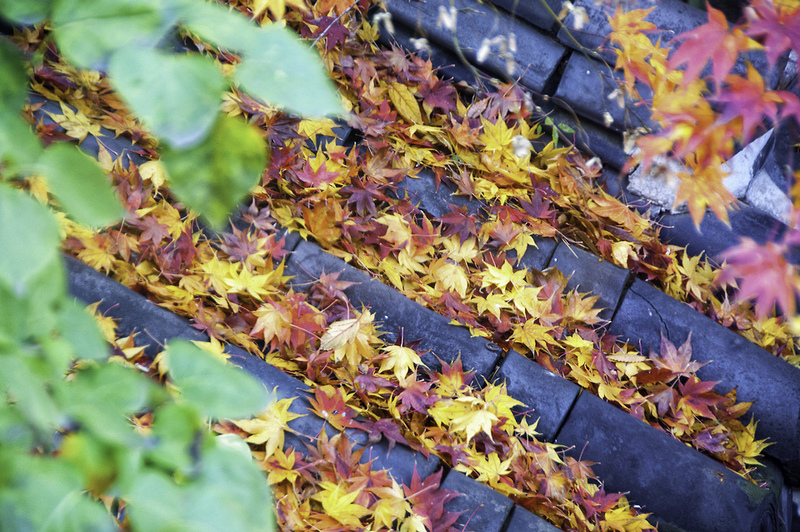 In Korea, not all plants in the regions will simultaneously change the leaf color but the process will take place in order from north to south. 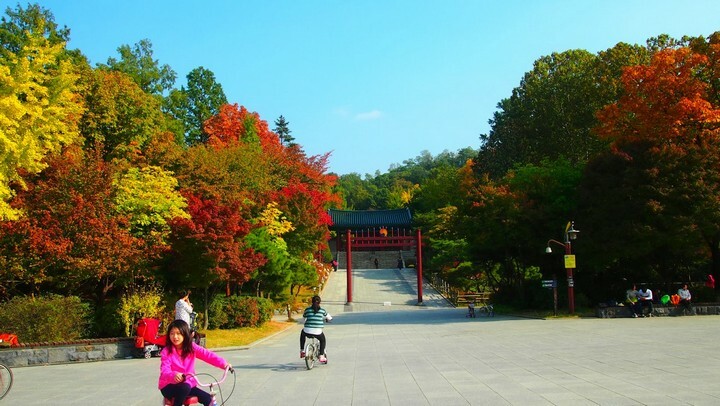 In northern provinces, as the temperature goes down faster, the leaves will change color sooner. 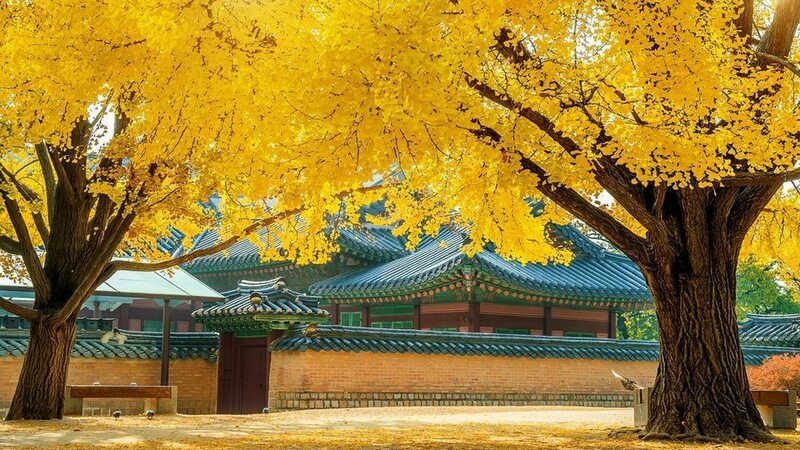 In the southern provinces, due to the warmer climate, the yellow foliage will change later. 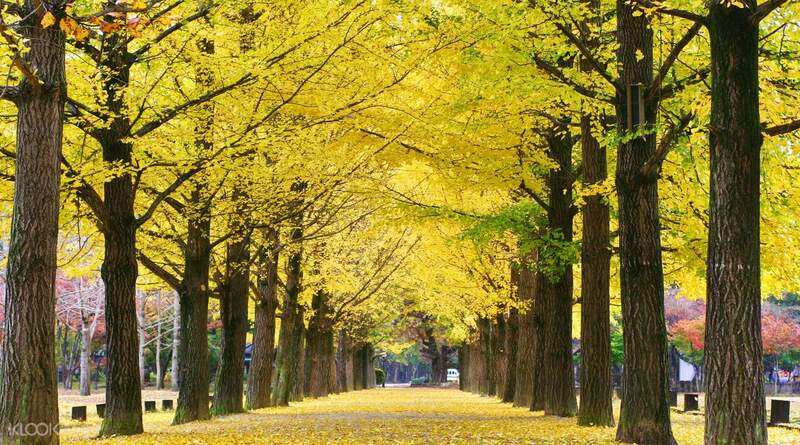 One of the tree species that symbolizes for the fall of Korea is Maple and Ginkgo trees. 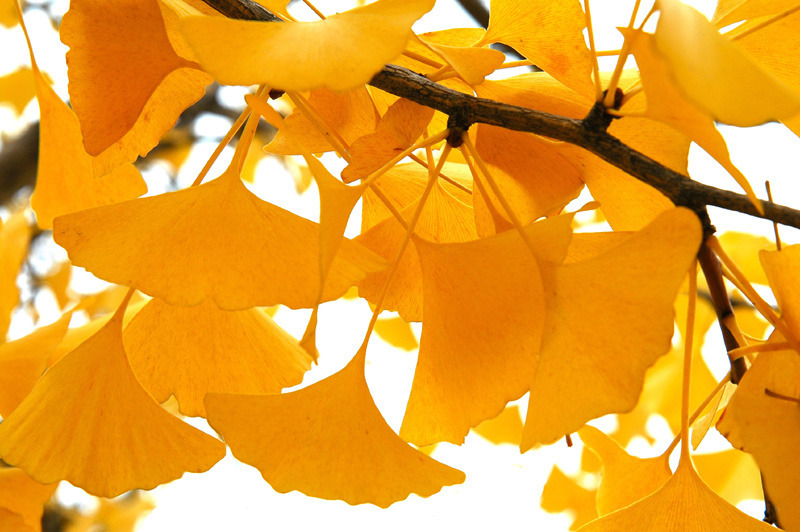 The maple leaves will turn into the bright red, while the Ginkgo leaves turn bright yellow. 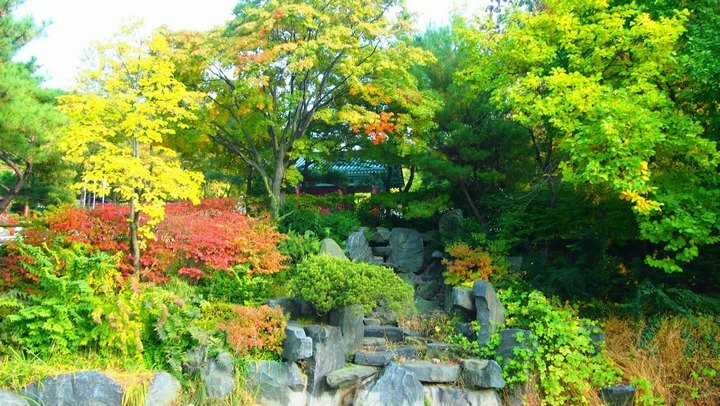 These two plants make to the Korean autumn landscape becoming more enchanting and romantic than ever. 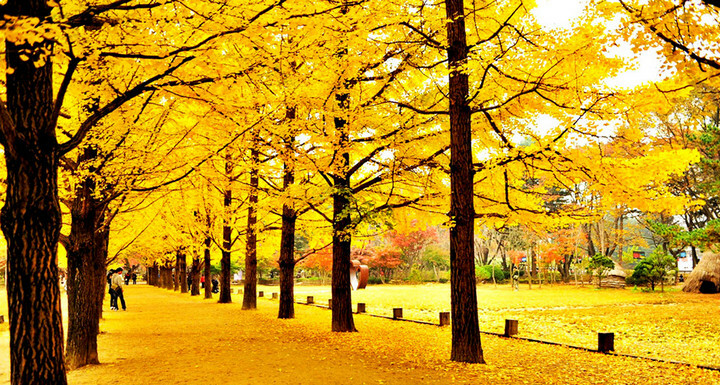 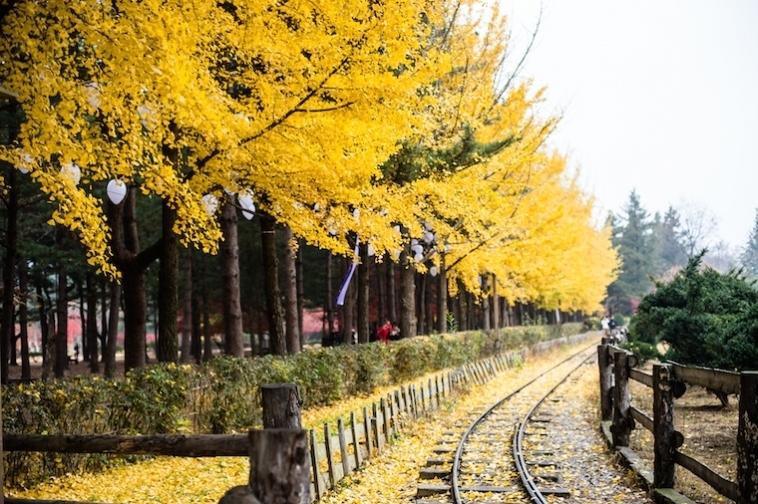 Row of yellow ginkgo trees in Nami Island. 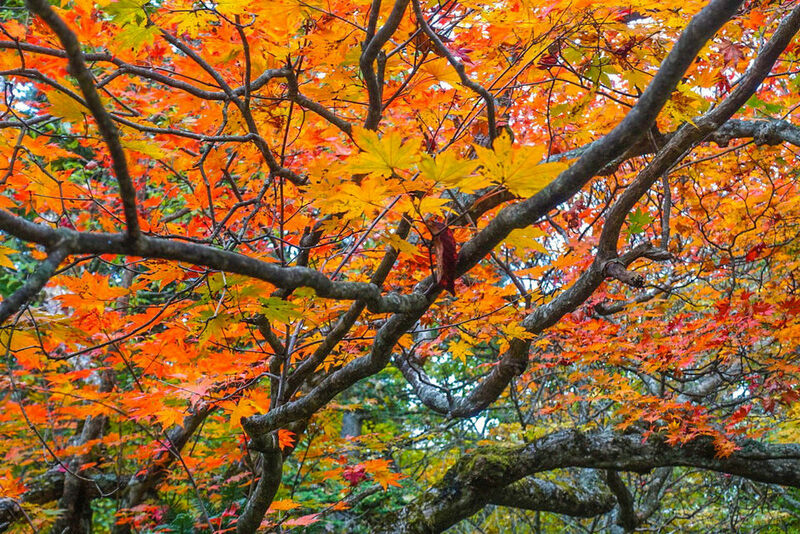 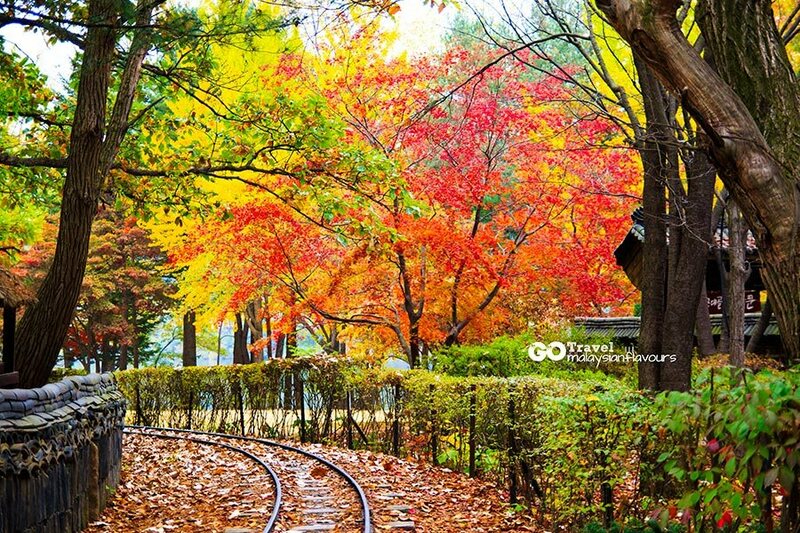 Credit: fall foliage destinations in Asia blog. 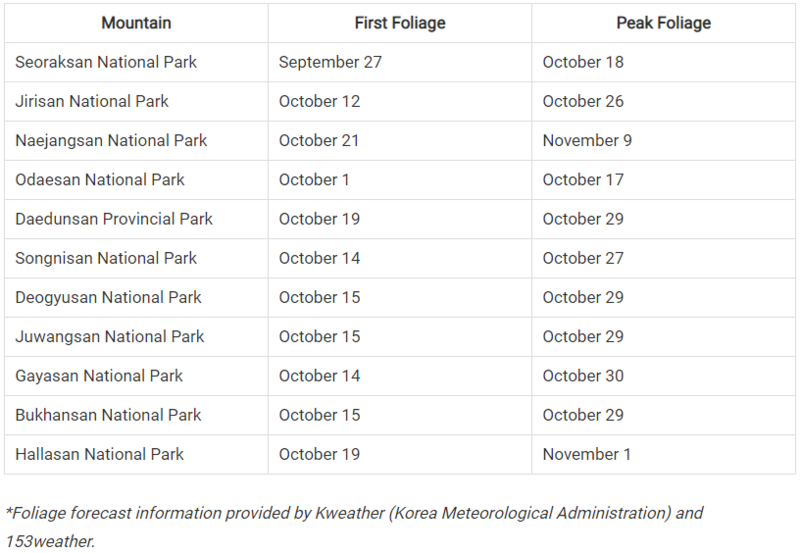 The Korea autumn 2018 forecast (Fall foliage forecast Korea 2018) by regions: The following is a forecast for the fall foliage map in Korea in 2018. 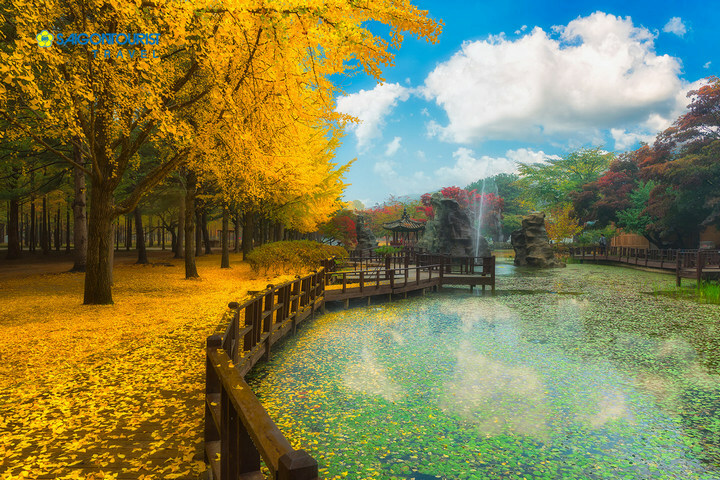 Fall foliage forecast korea 2018 (korea fall foliage forecast 2018) map. 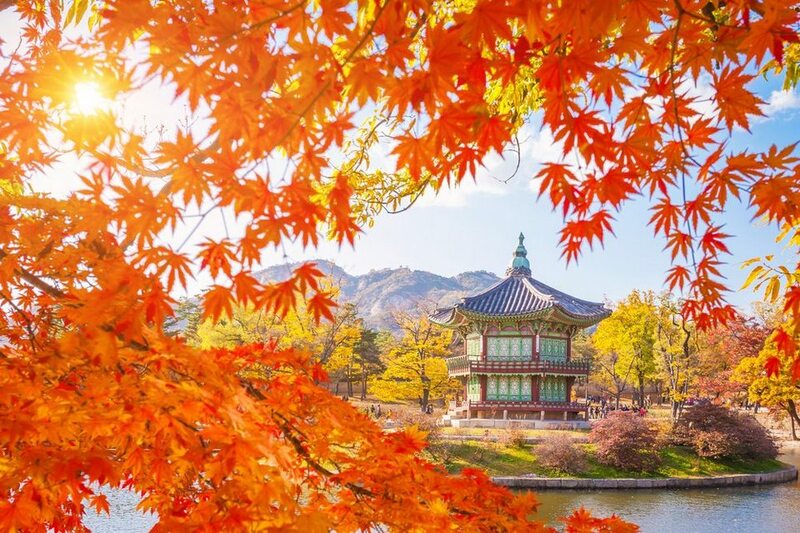 The Korea autumn 2018 forecast by regions. 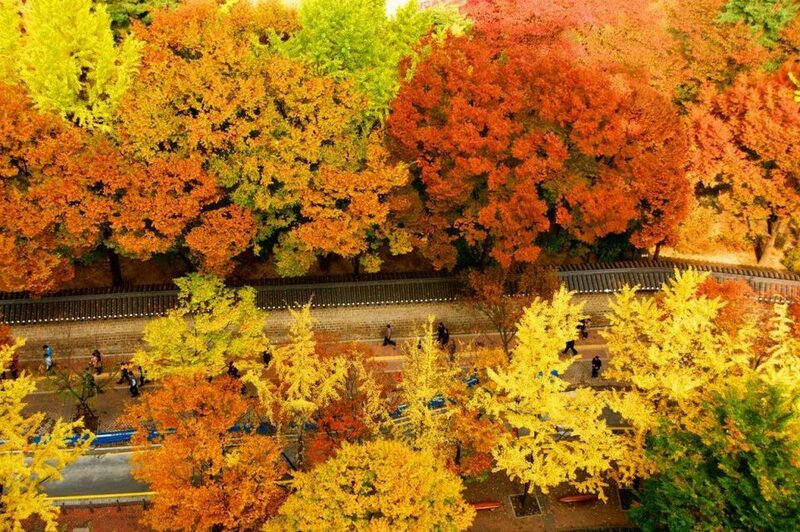 Credit: Seoul fall foliage 2018 forecast blog. 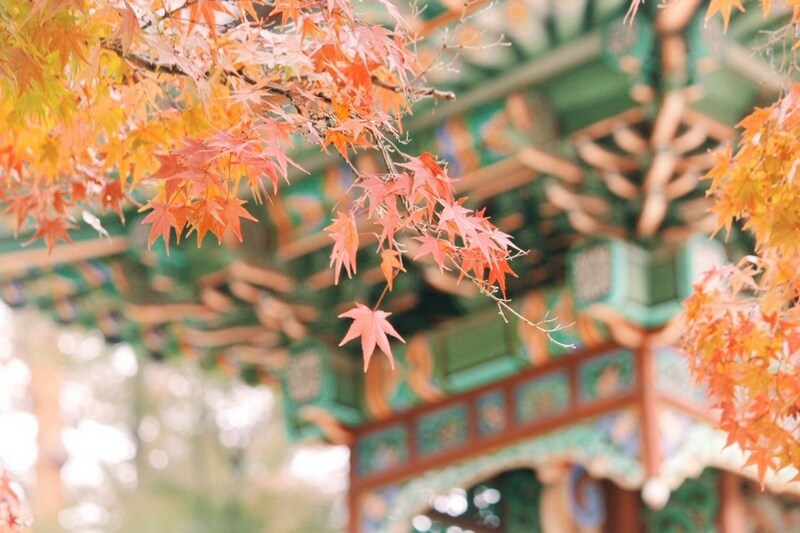 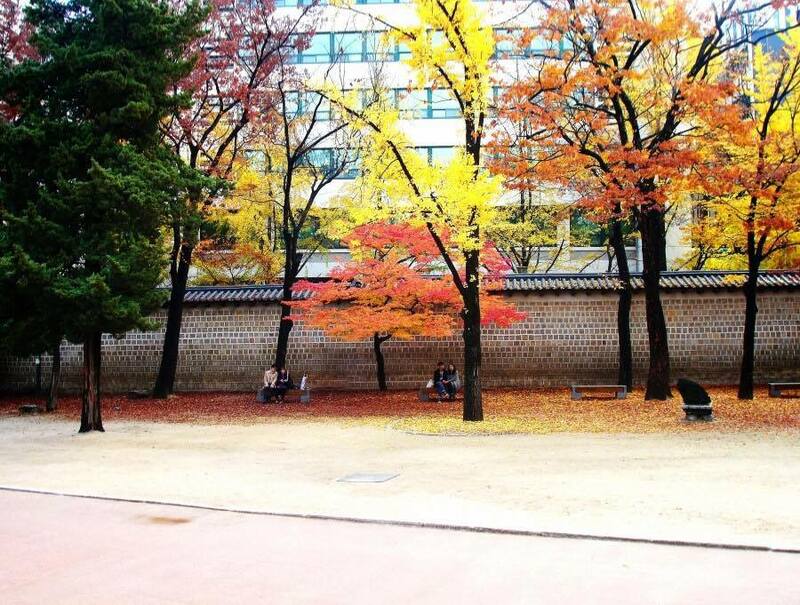 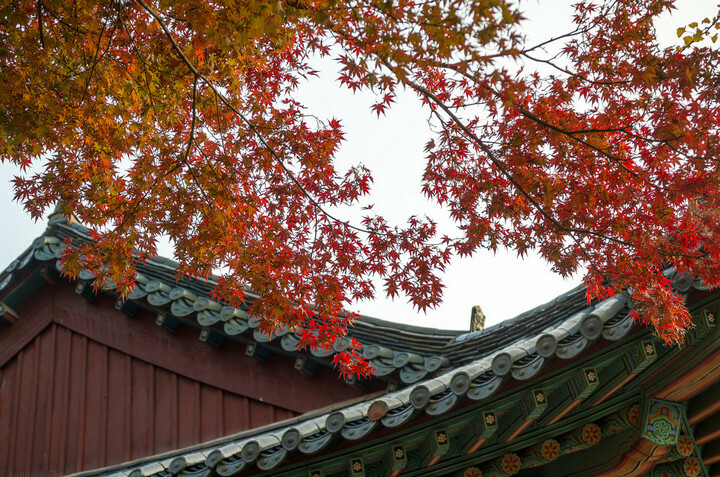 In the heart of Seoul, there are beautiful places to see the autumn leaves. 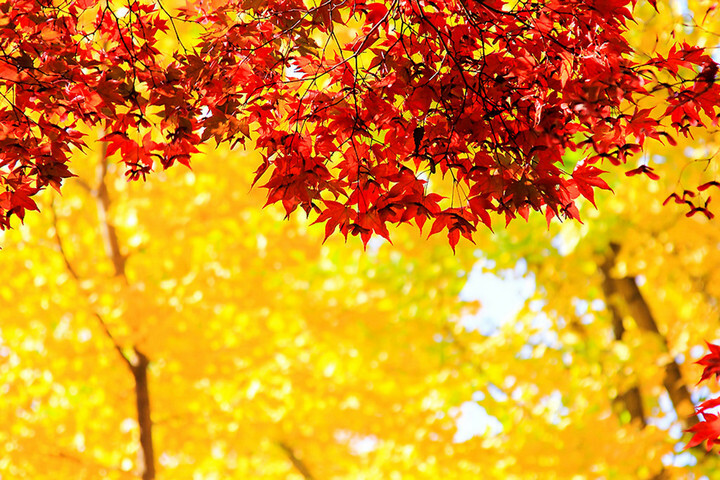 And, what’s more wonderful, when you can watch fall foliage on the streets, when you go to work, and when you drink coffee with friends? 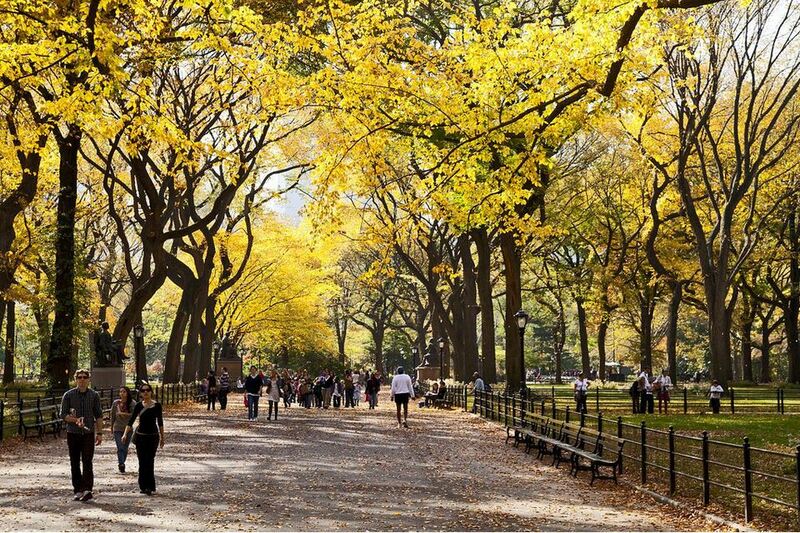 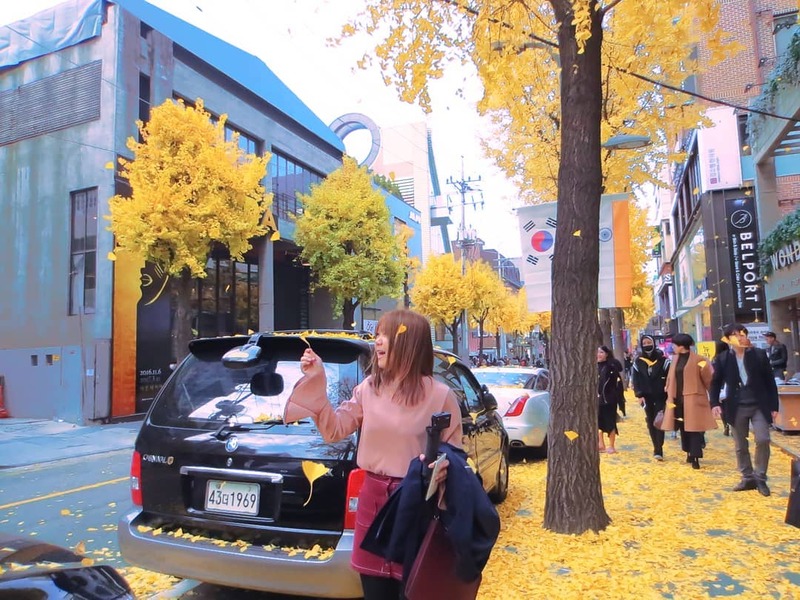 The three streets listed below have gorgeous ginkgo trees, fashion boutiques and art coffee shops that make every moment of your autumn is so romantic, hard to fade in mind. 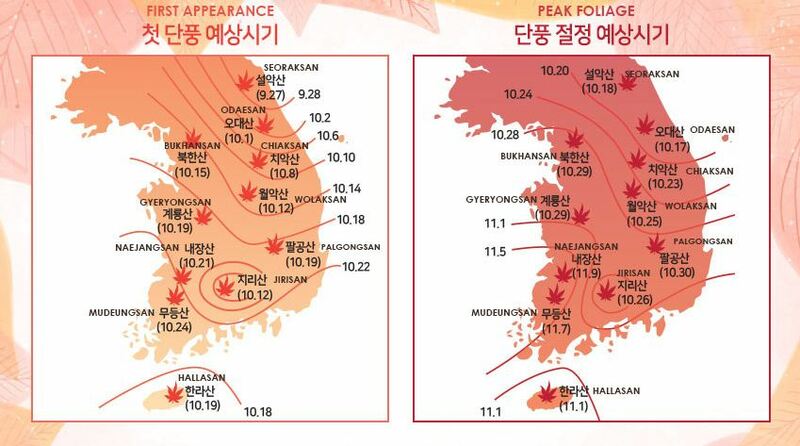 Referring to Bukhansan region, the Seoul fall foliage 2018 forecast may be between Oct, 15 (first appearance) and Oct, 29 (peak foliage), early November. 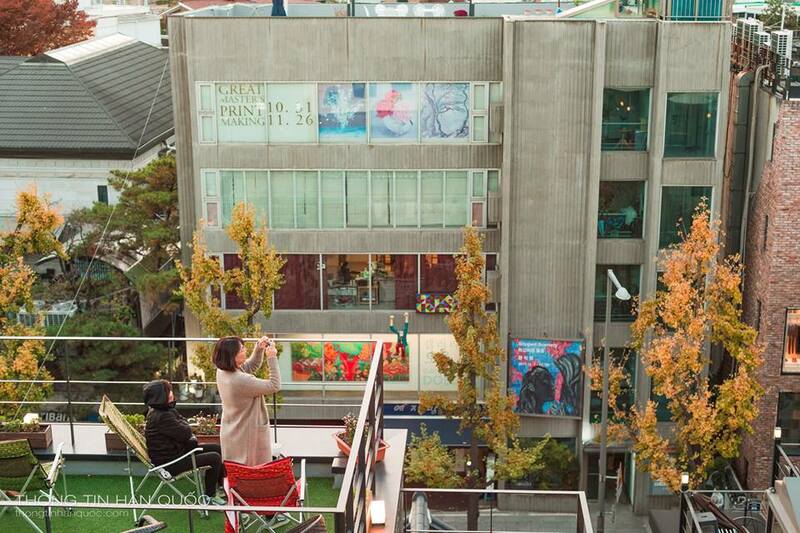 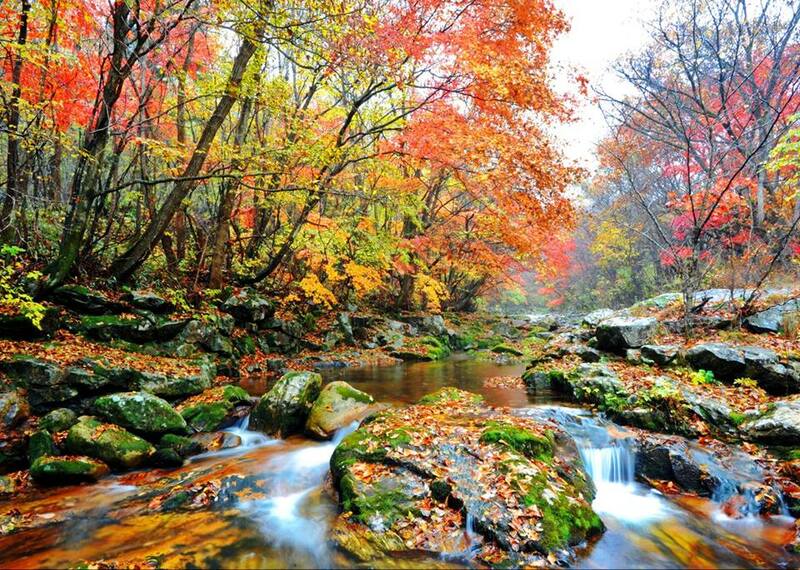 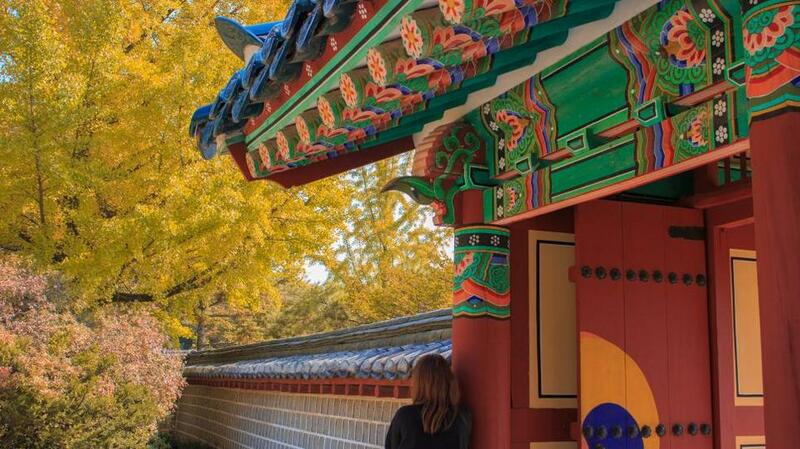 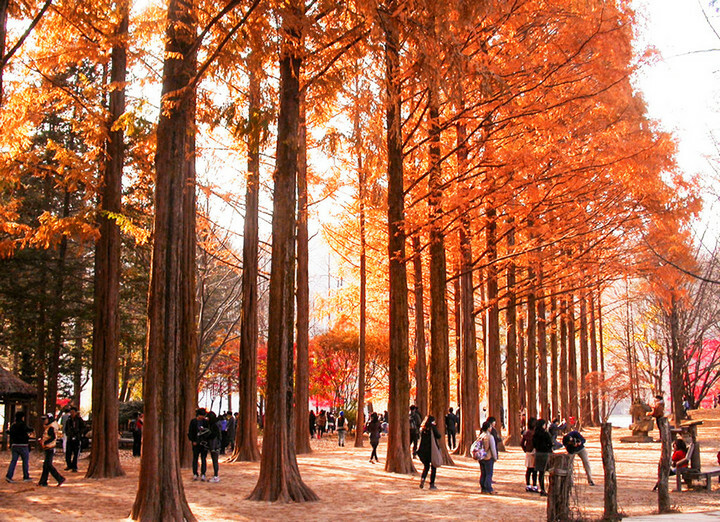 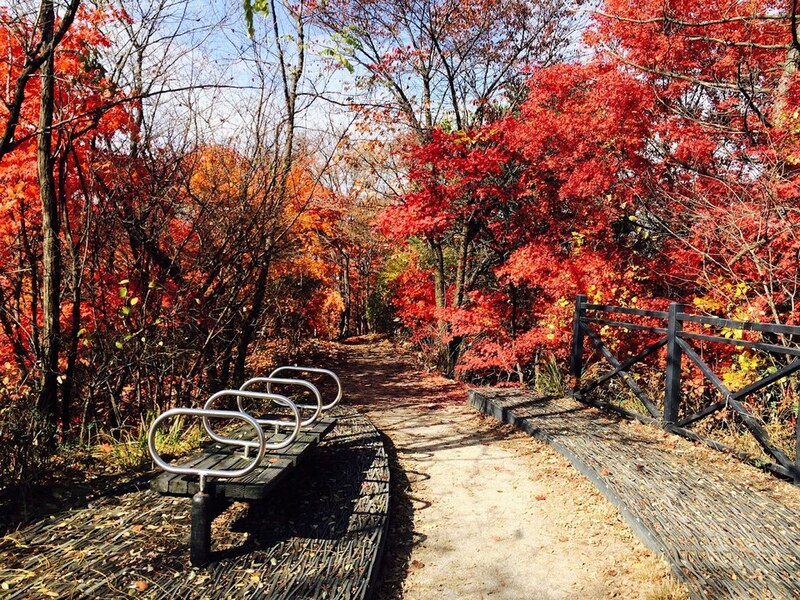 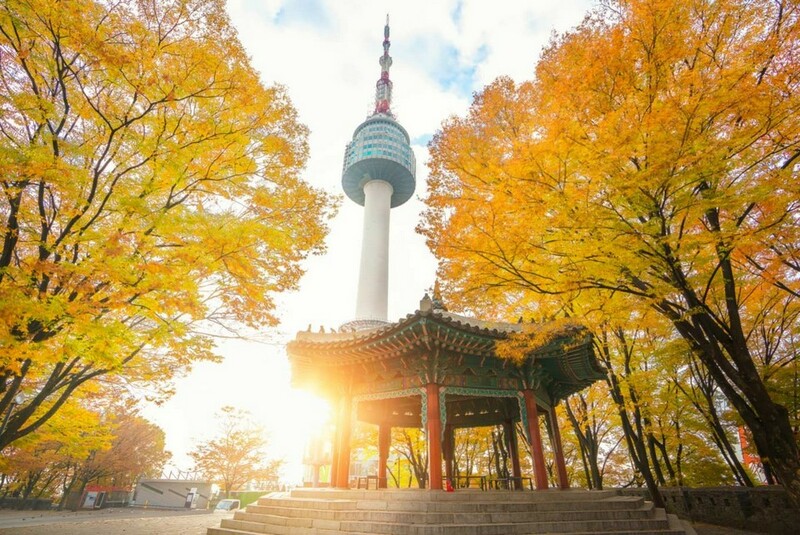 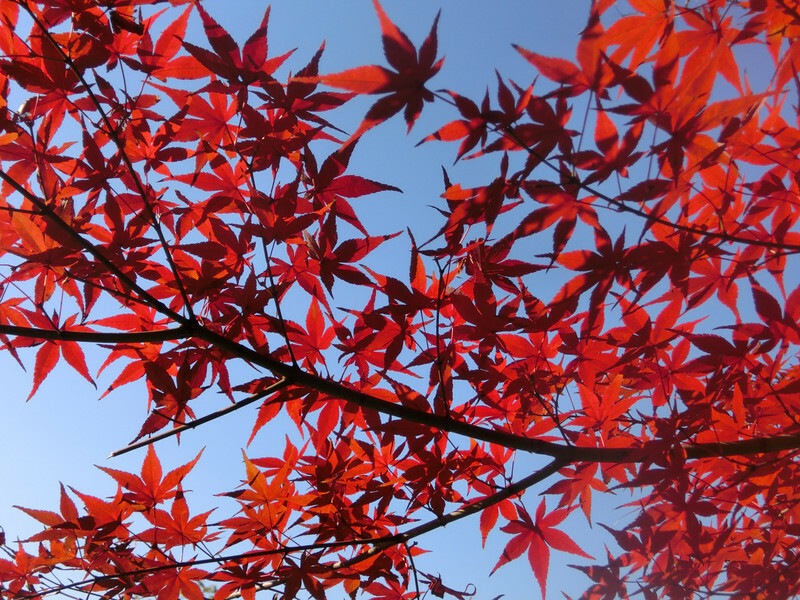 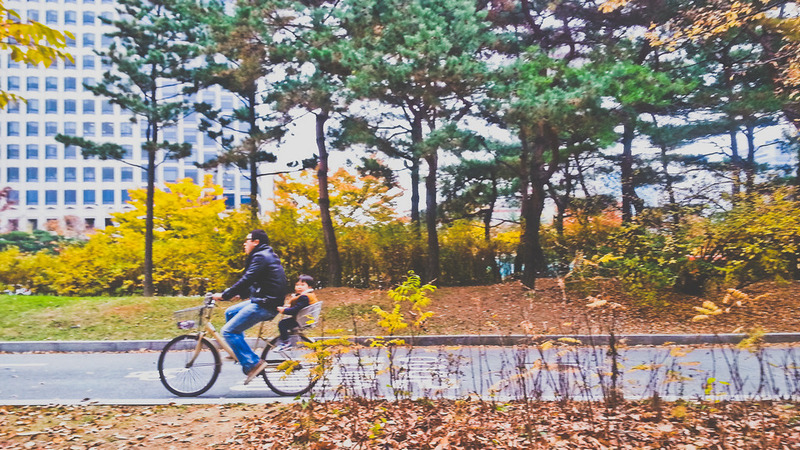 Now, let’s explore some best places to see autumn foliage in Seoul. 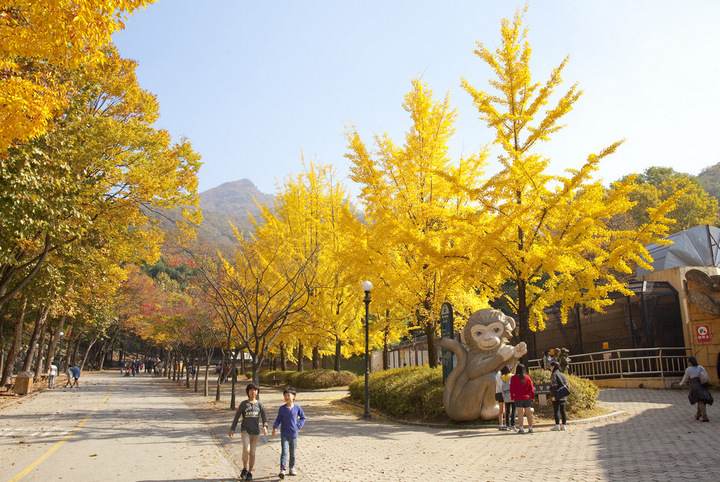 When the weather turns to autumn, everywhere in Korea is tinted with a yellow – red color of leaves is characteristic of maple trees, ginkgo trees. 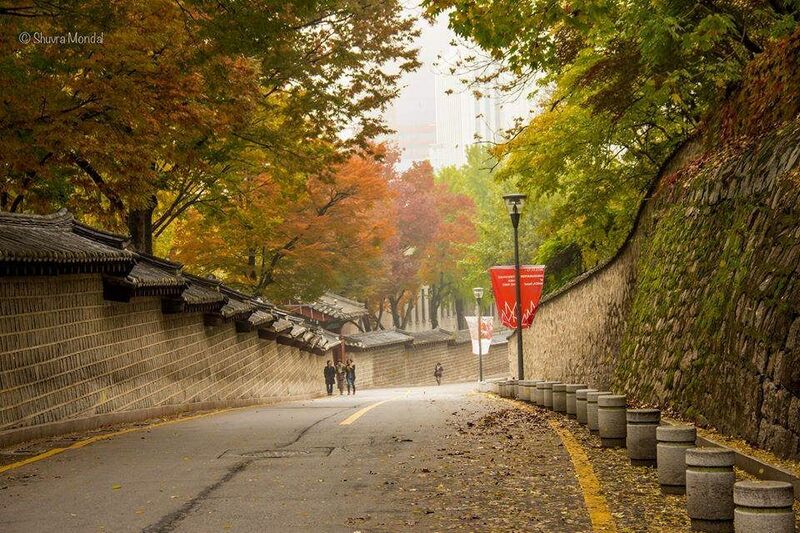 However, if you do not want to live in haste with bustling of Seoul, enjoy the best autumn in peaceful, ancient and poetic place as the Samcheong-dong area is “extremely reasonable”. 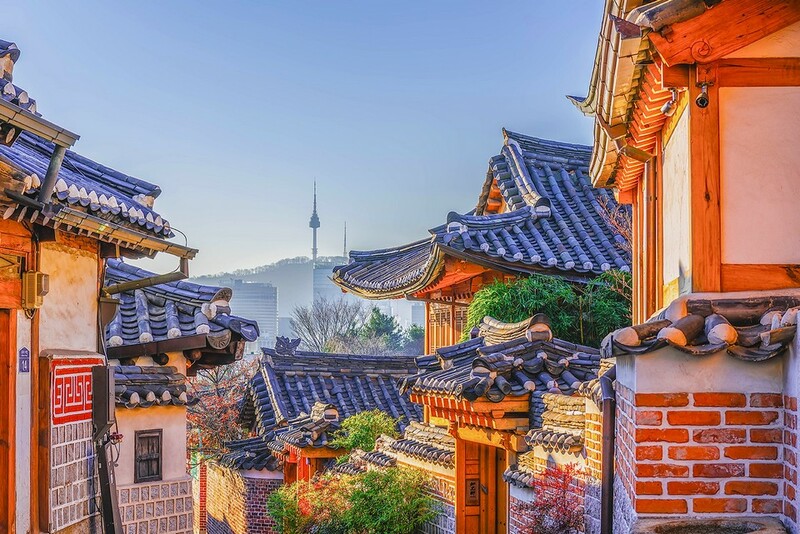 Samcheong-dong is best known for its ancient Hanok village along with other popular Korean tourist attractions such as Insa-dong palace, Changduk and Gyeongbuk. 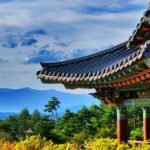 This small town is a unique place, with a “population” of eateries, souvenir shops, sightseeing sites with ancient architecture. 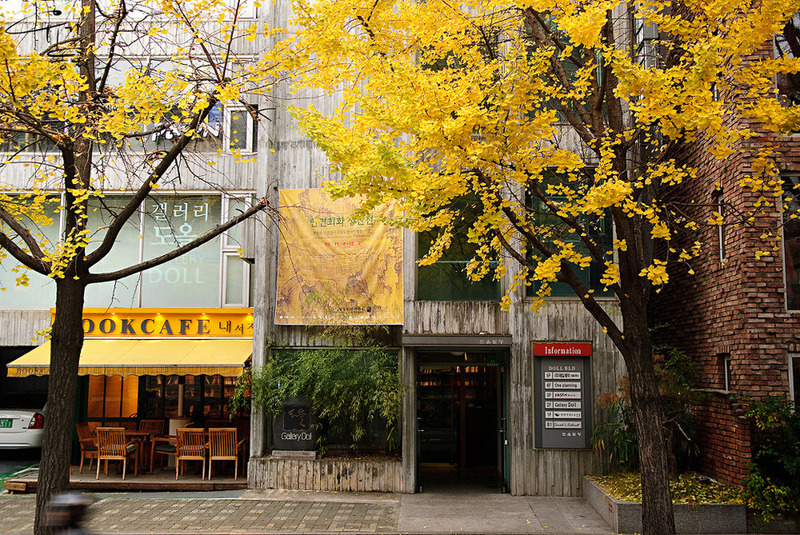 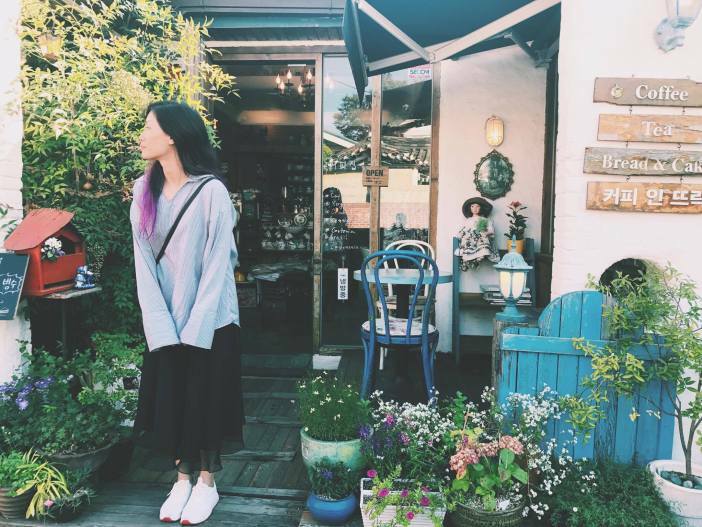 All the shops in Samecheong-dong are pretty, small, but they are all very artistic! 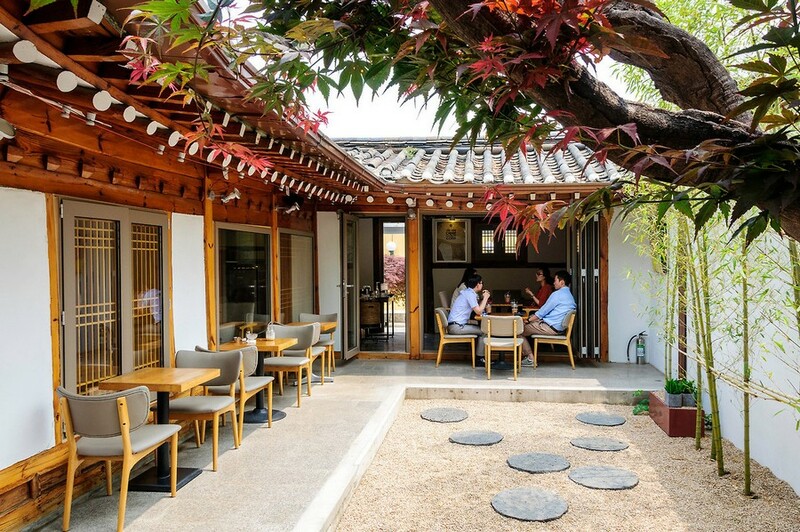 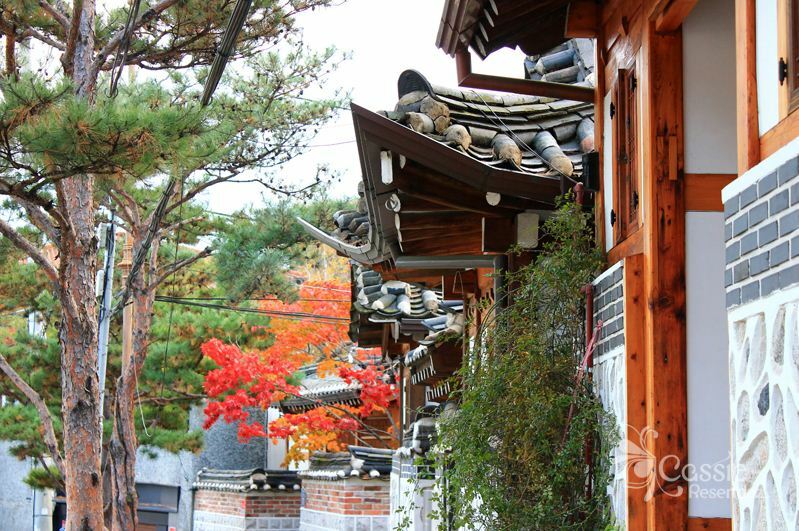 You can stroll around the ancient houses of Hanok Village, or the classic European-style Samcheong-dong street. 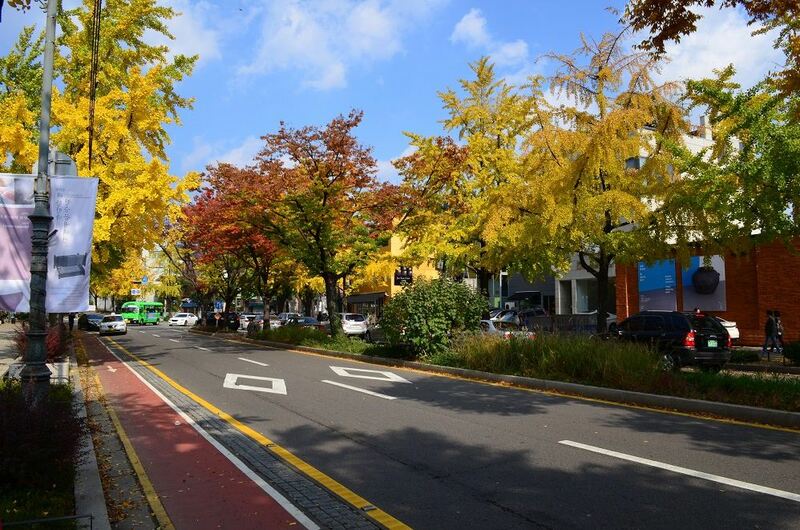 Credit seoul autumn foliage 2018 forecast blog. 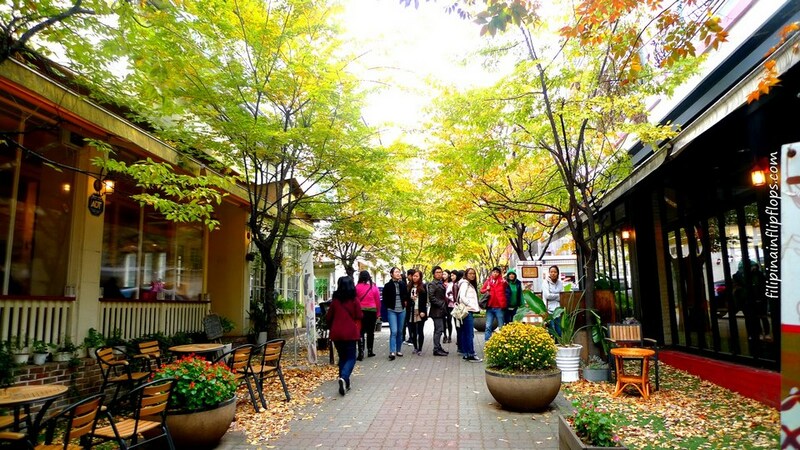 Do not worry about the Samcheong-dong area near the old village, so you will think this area have nothing to shopping or eating except souvenirs. 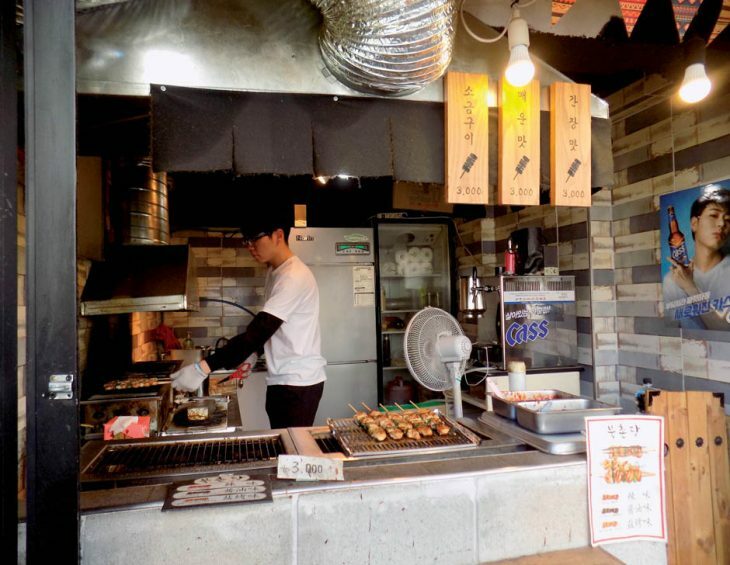 This neighborhood will be full of dishes from Europe to Asia, from street food stalls to modern restaurants that even spend a week can not eat all. 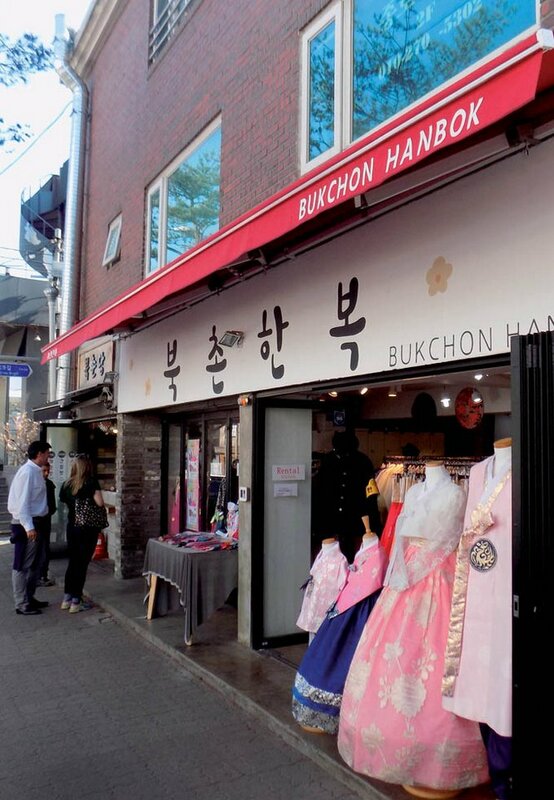 Lovely little shops along the way with many delicious and tasty snacks. 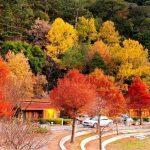 Credit south korea fall foliage forecast 2018 blog. 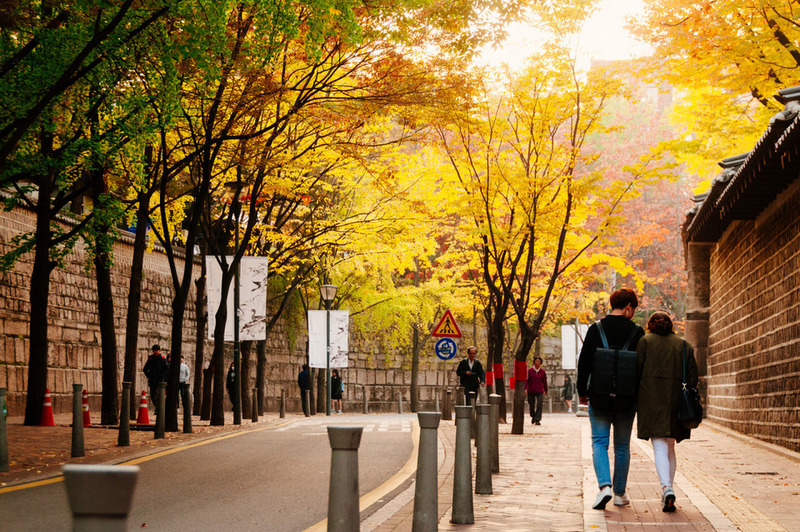 Walking slowly on the small streets of Samcheong-dong on a sunny afternoon of autumn, occasionally passing through the shops that broadcast “romantic” songs, you will feel like you are the main character in a Music video or a movie romantic of Korea. 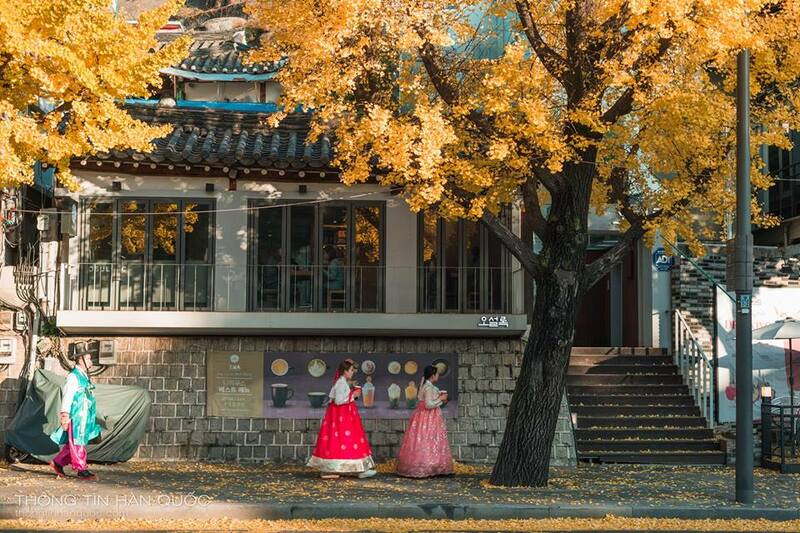 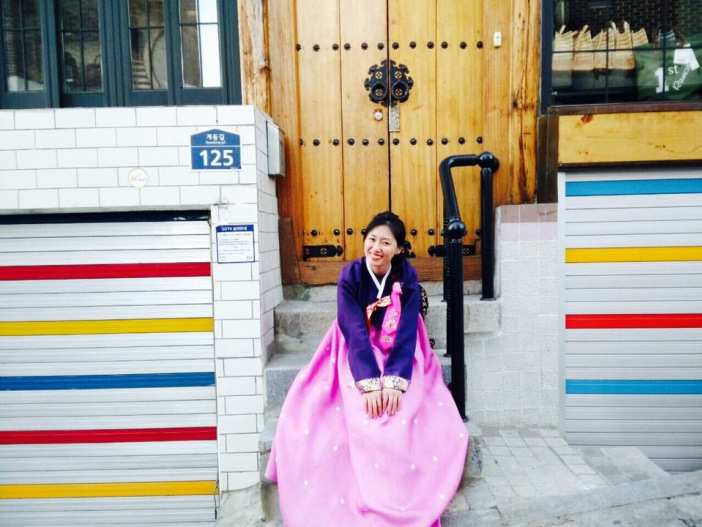 The best time to travel to Korea in the fall, but also visit the ancient village and take some pictures in beautiful Hanbok costume, you get 10 points for quality. 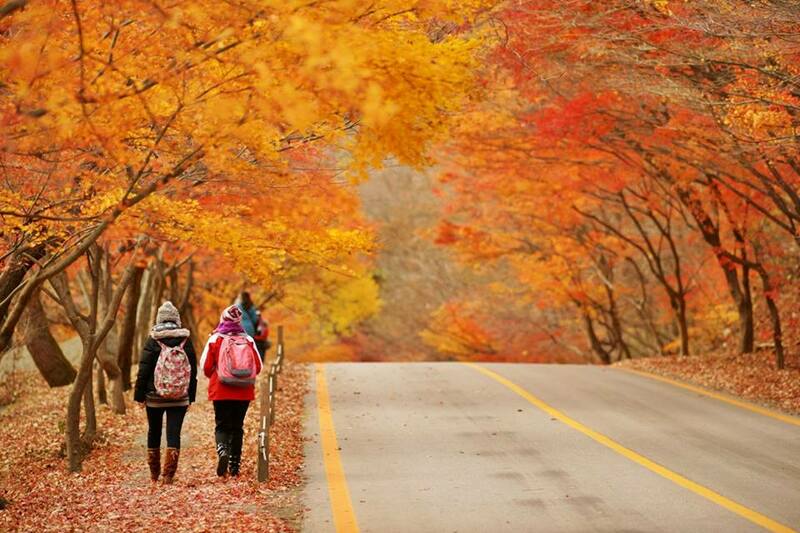 Image by fall foliage south korea 2018 blog. 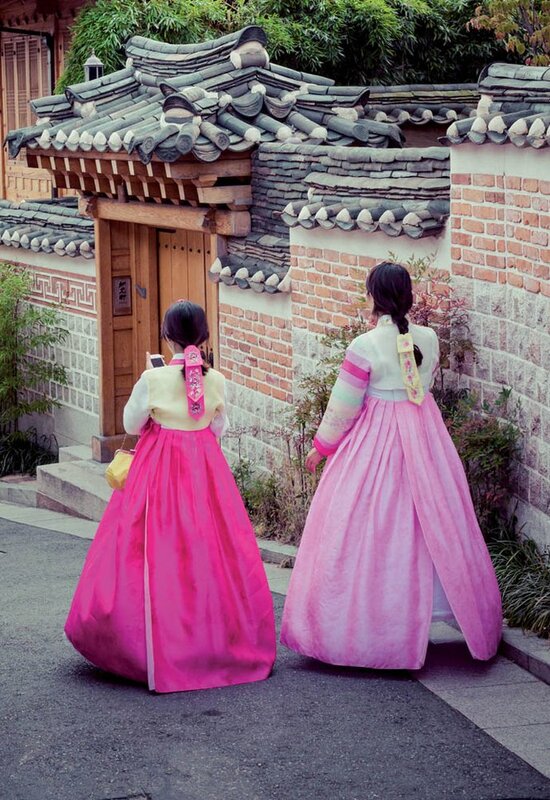 The most beautiful traditional clothes of the planet because of who wear it is also beautiful. 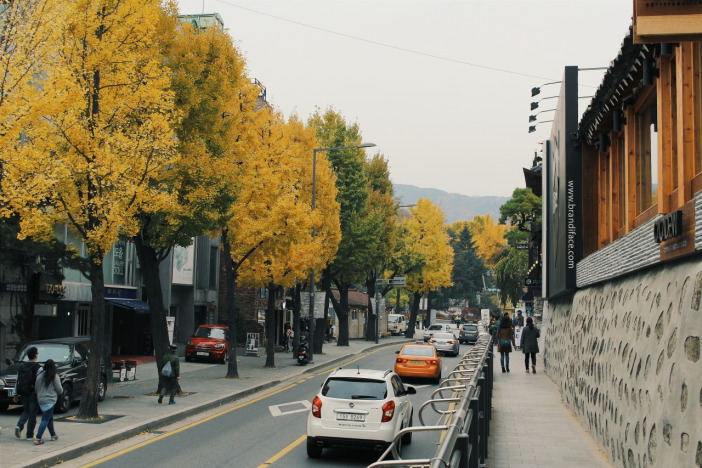 Getting to Samcheong-dong: Take the subway to Anguk Station, Exit 1 or 2, go about 300 meters to the ancient village of Bukchon, but you will not turn right to go to the ancient village but go straight about 1-2 kilometers to going to Samcheong-dong. 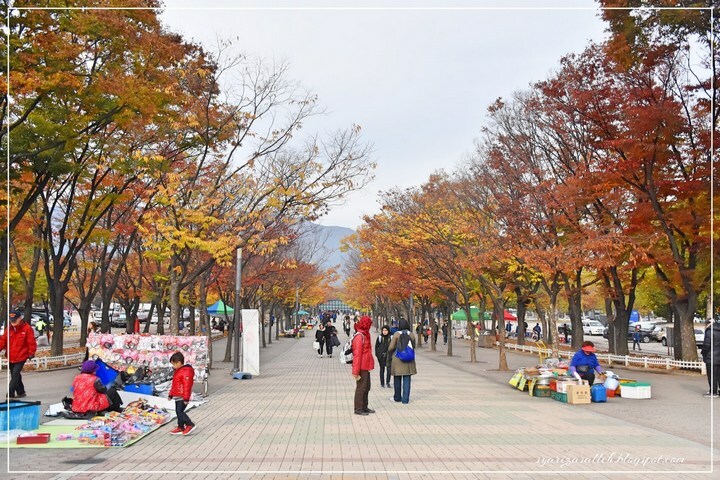 Photo: korea autumn 2018 forecast blog. 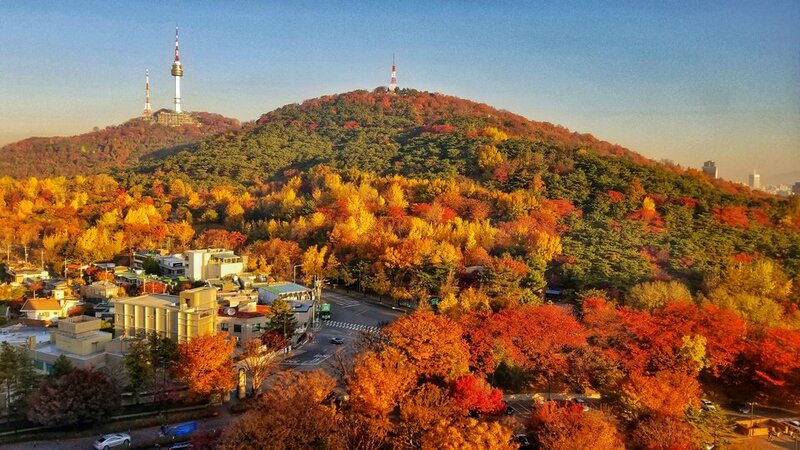 Picture: seoul autumn foliage 2018 forecast blog. 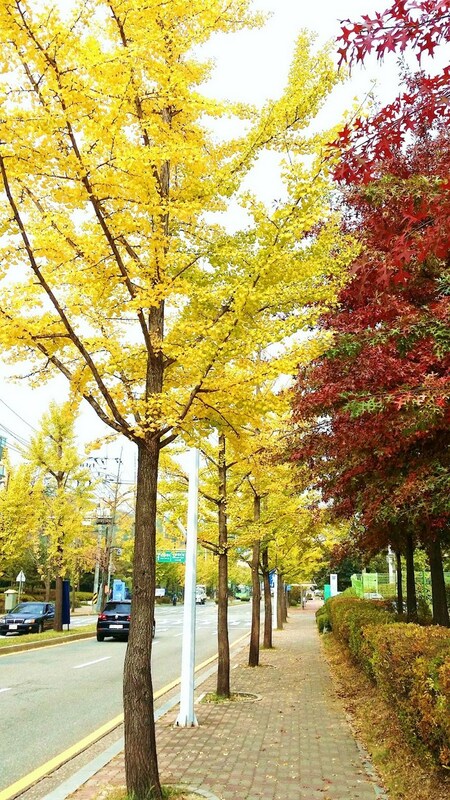 Image by: seoul autumn 2018 forecast blog. 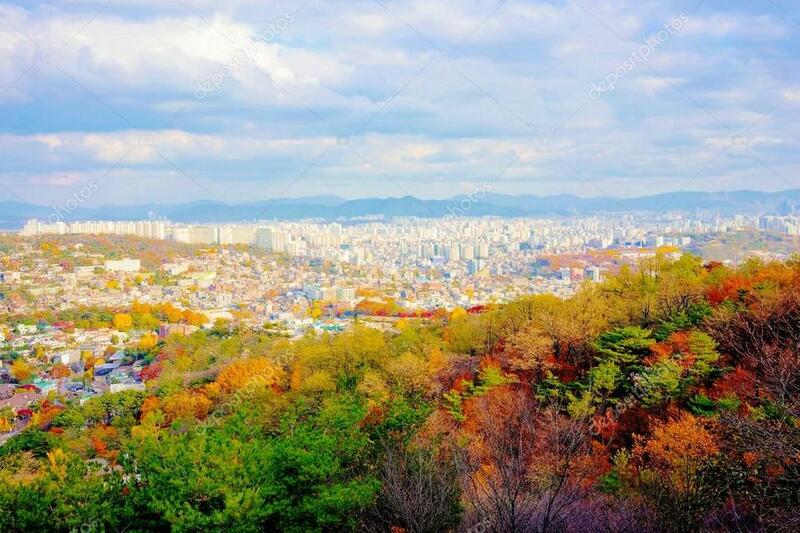 If you are a high-altitude lover an enjoys exploring nature then the fall experience in Seoul from Namsan Mountain is a great idea. 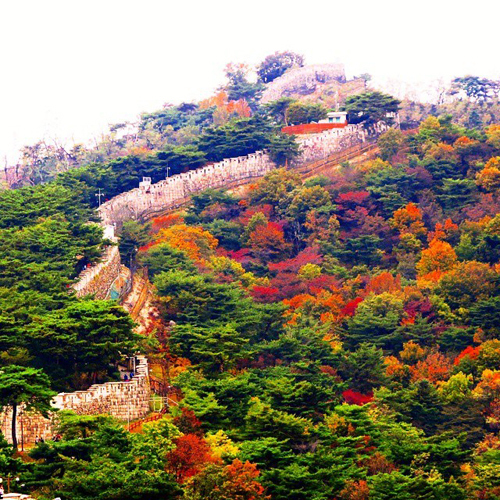 On the way to the mountain, you will enjoy the colorful nature of autumn and the small houses hidden under the foothills like the watercolor paintings that make your heart race. 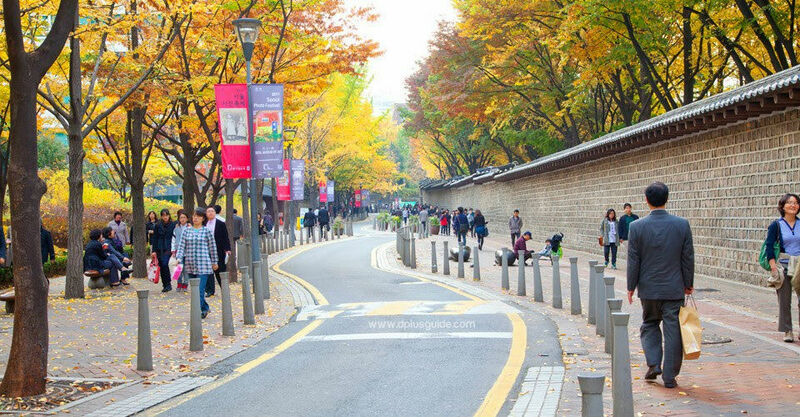 The road from Namdaemun Market to Namsan Library, stretching to the hotel of Grand Hyatt Seoul, offers a dramatic natural landscape of autumn. 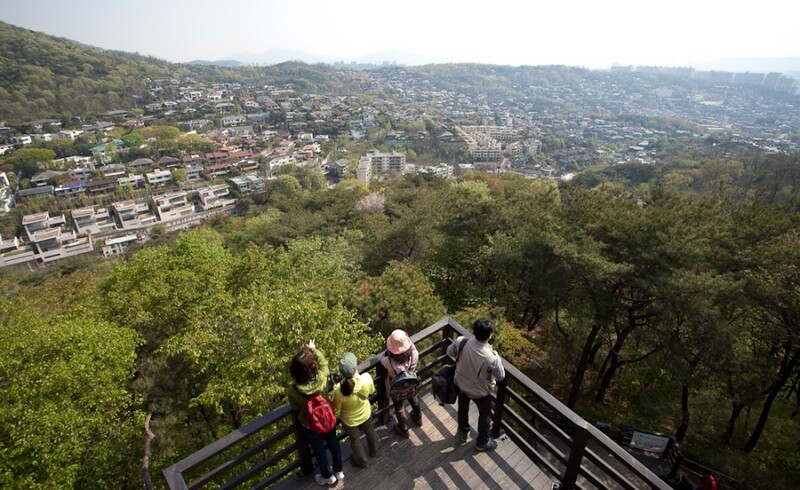 On the way up the mountain, you also can look down at the foothills and watch the whole scene of Seoul. 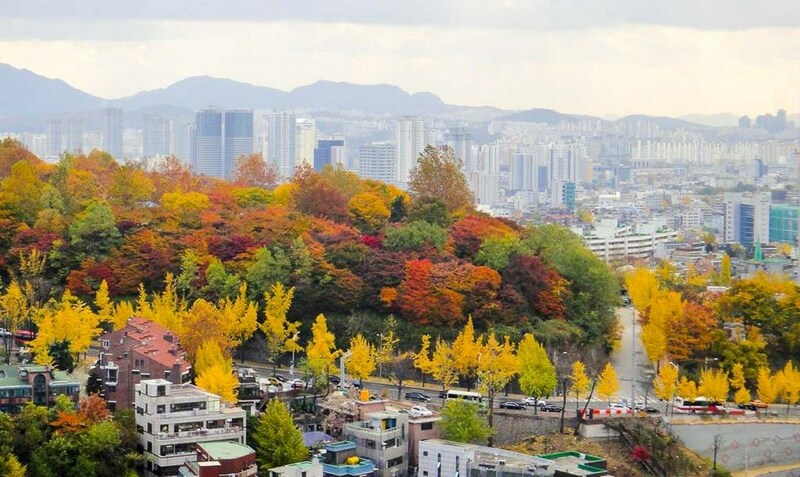 It is also the ideal place to watch the sunset in the red leaves forest and panoramic views of the whole city of Seoul. 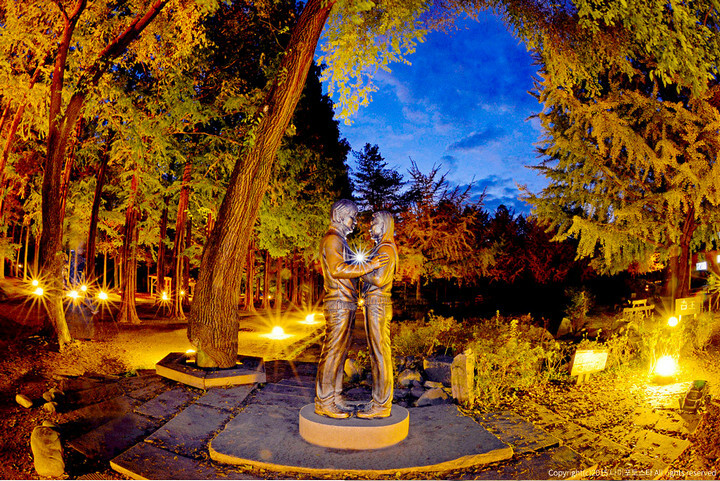 The moment the sun goes down, visitors can enjoy a cup of coffee and immerse themselves in the scene of the sunset over the forests. 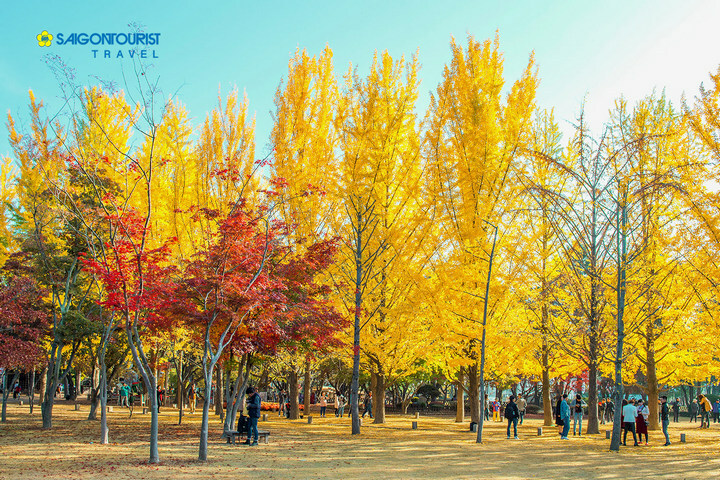 You can also explore the surrounding tourist attractions such as Namsan Botanical Garden, Goethe Institute, Namdaemun Market. 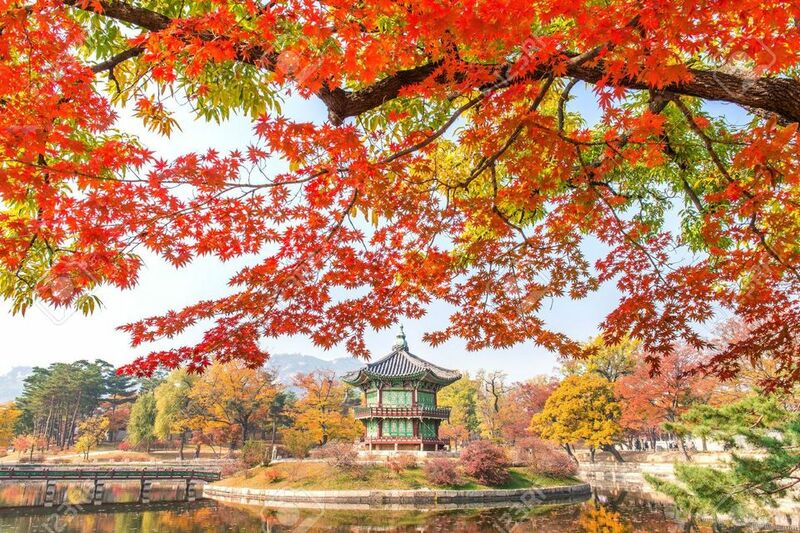 Foto by: korea fall foliage forecast 2018 blog. 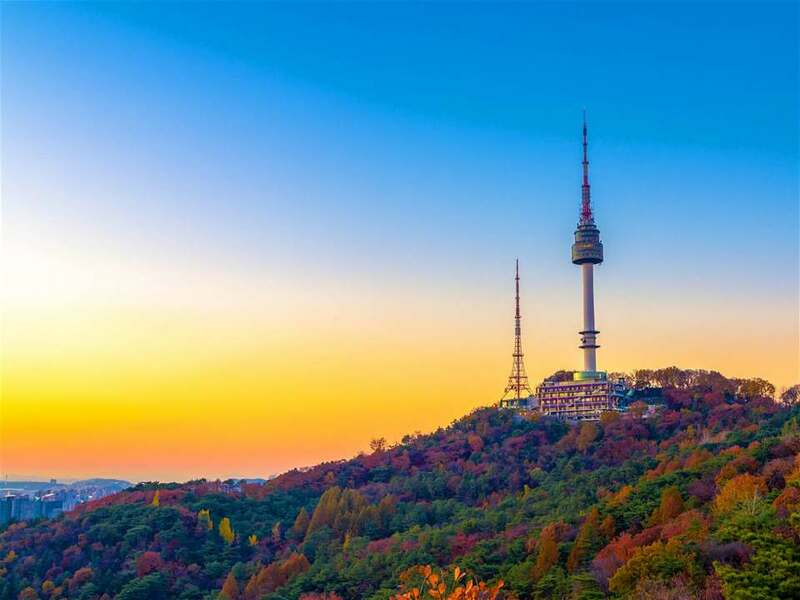 The whole Seoul city view and Namsan mount at sunset. 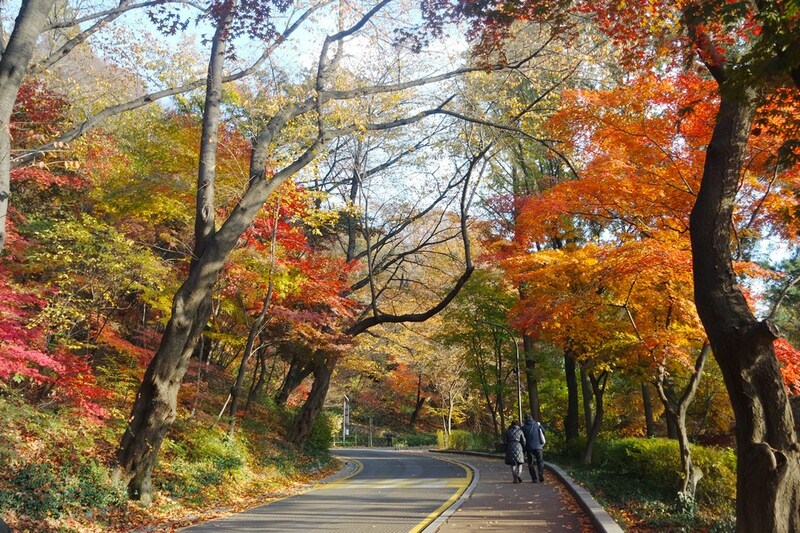 Haneul Park is located at the top of Haneul Mountain, where there is a reddish wood road over 900 meters long. 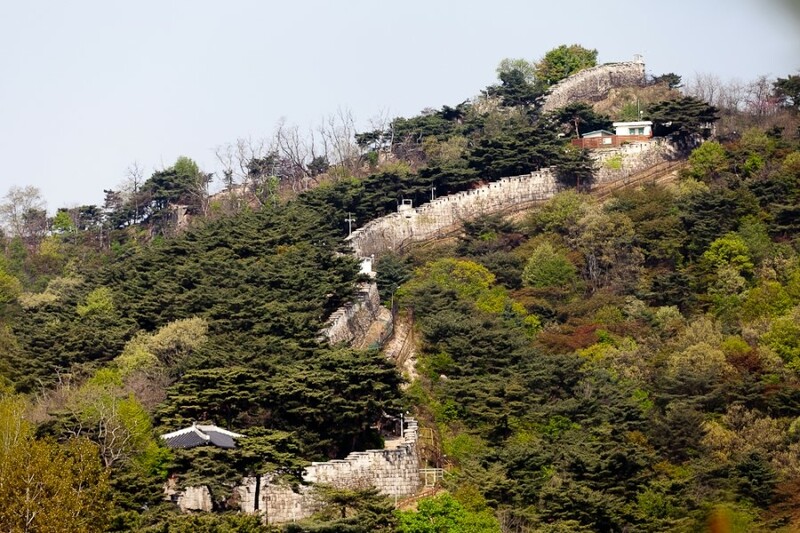 To reach the top, you have to climb more than 290 steps or walking along a winding road. 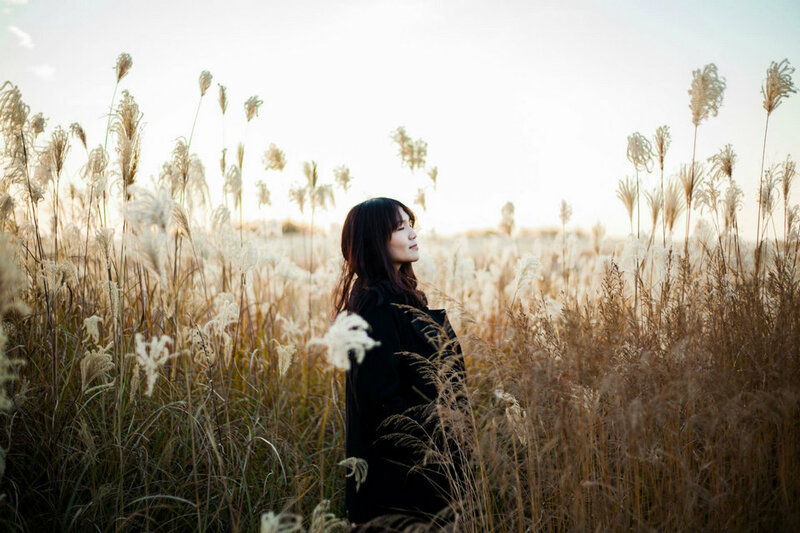 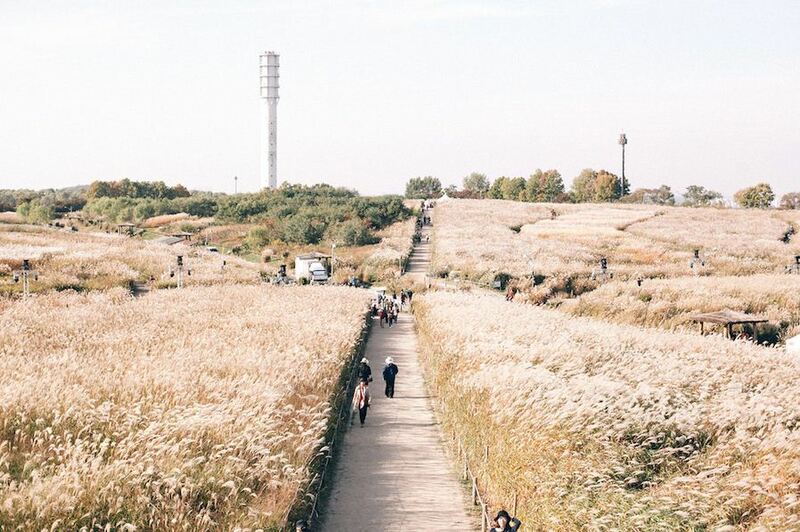 In addition to the lines of red leaves trees of autumn, you also get lost in the silver grass fields (pampas grass) that endless stretch like in the movie when reaches the top of the mountain. 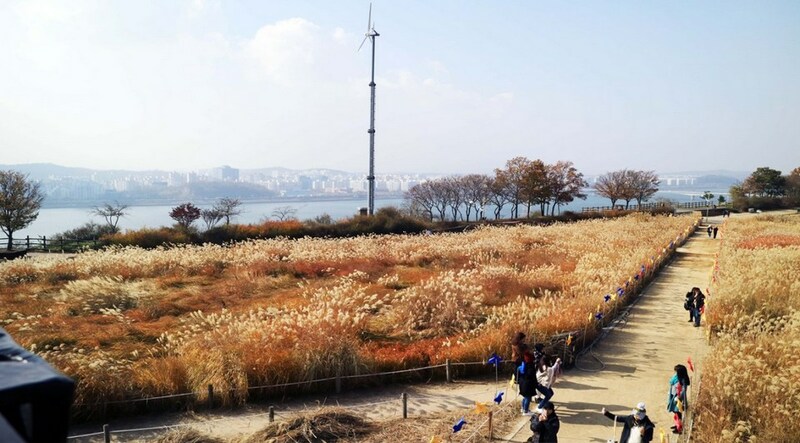 In the autumn, the Seoul Eulalia Festival (Silver Grass Festival) is held at the top of Haneul Mountain to honor the beauty of this grass. 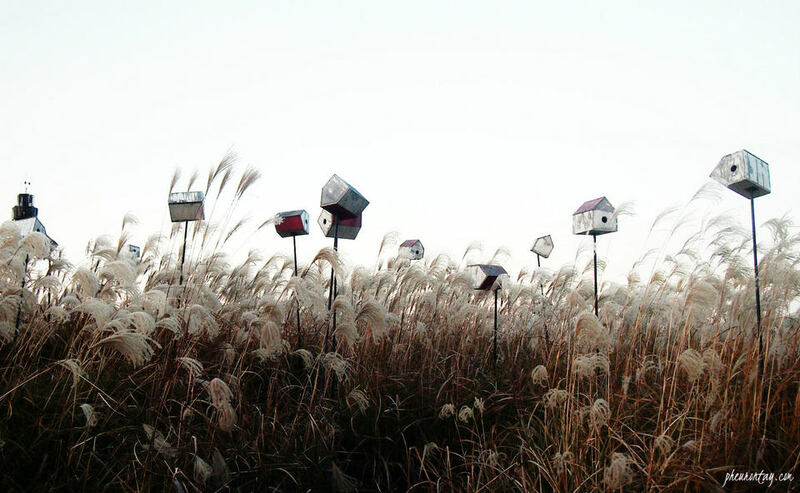 The bulbuls (silver grass flowers) swaying in the wind like a wave of silver, blowing autumn air into the hearts of visitors. 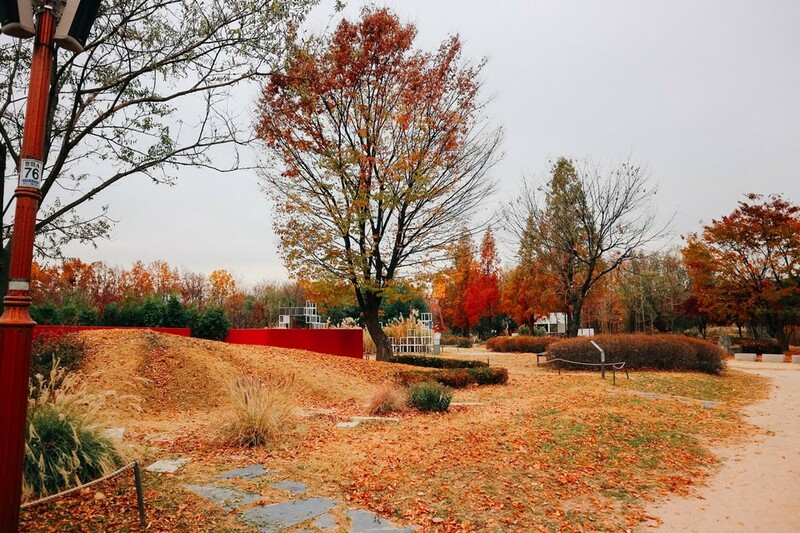 Attractions around: World Cup Park, Nanji Hangang Park. 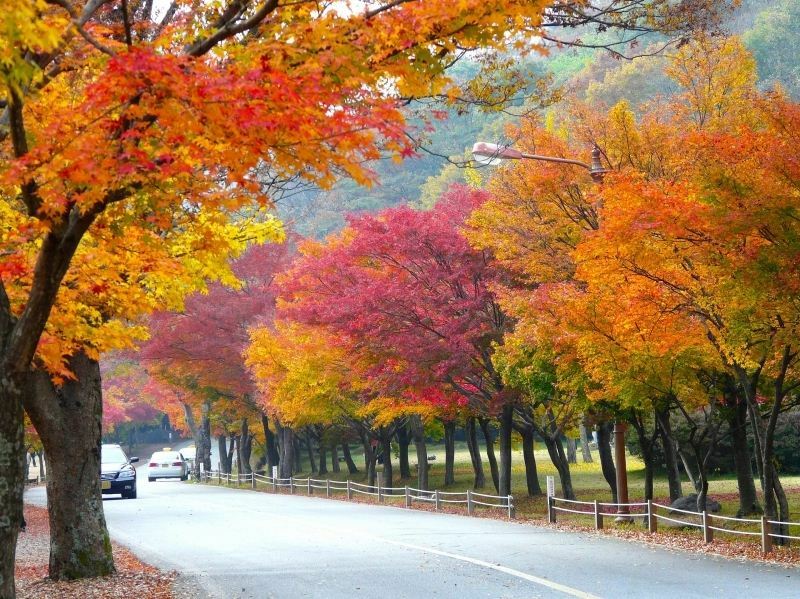 Credit: fall foliage forecast korea 2018 blog. 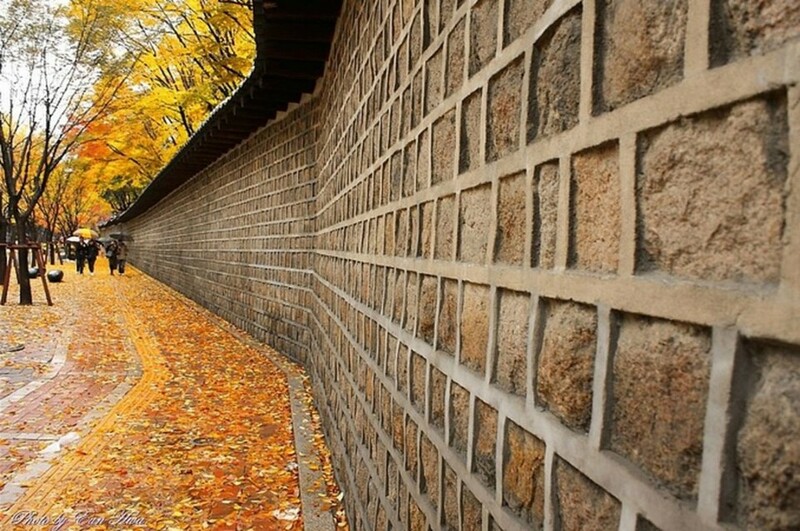 If China has the Great Wall, Korea is known for its Bugaksan fortress wall. 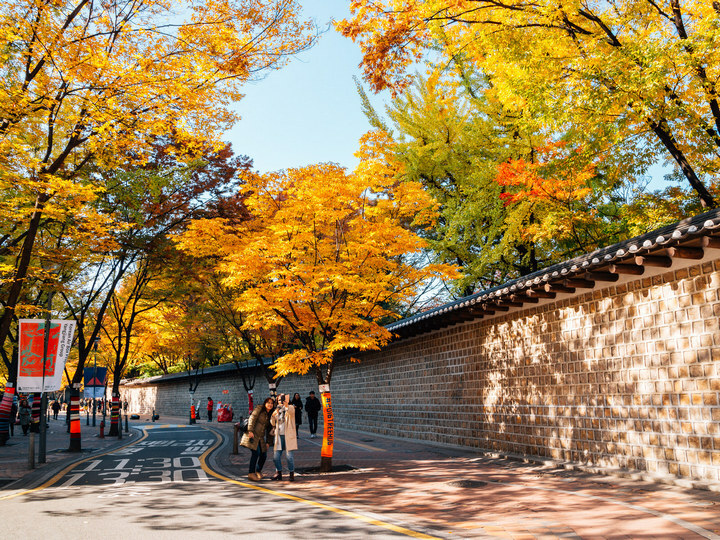 Bugaksan is a popular tourist spot in Seoul. 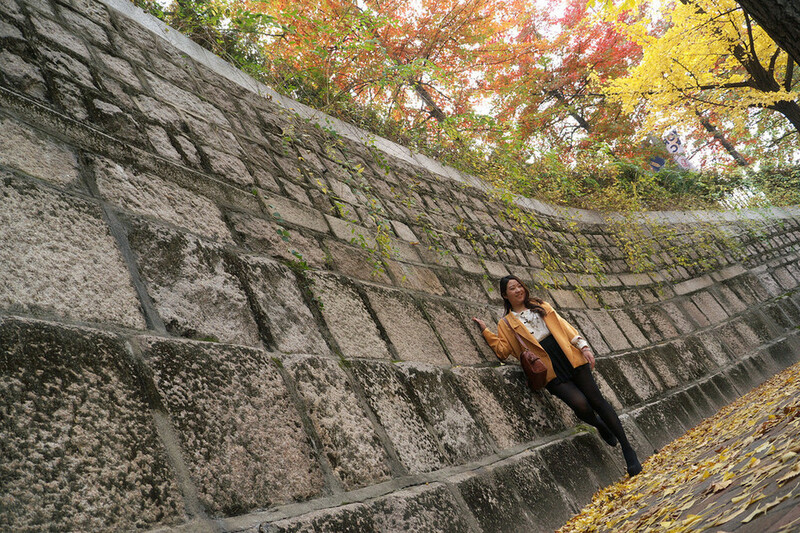 Visitors visit here not just in the fall but any time of the year to enjoy the panoramic view of the city. 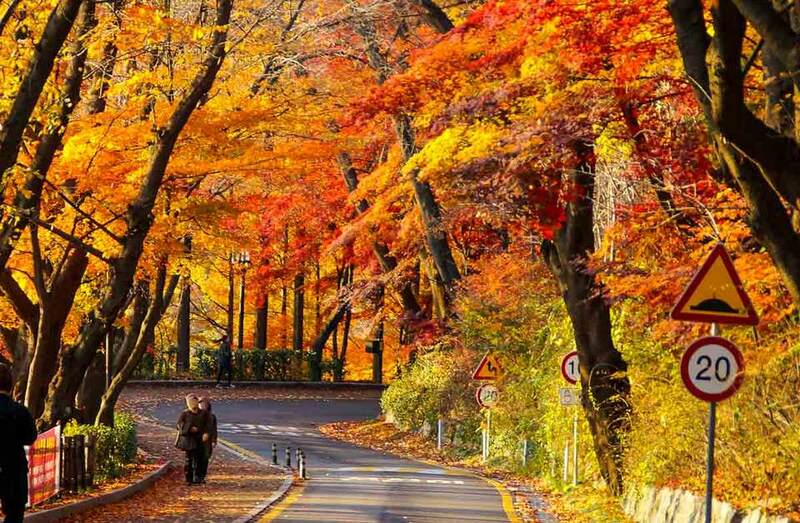 Although not comparable in length but Bugaksan is known to the road surrounded by two solid walls and the rows of red leaves trees characteristic autumn. 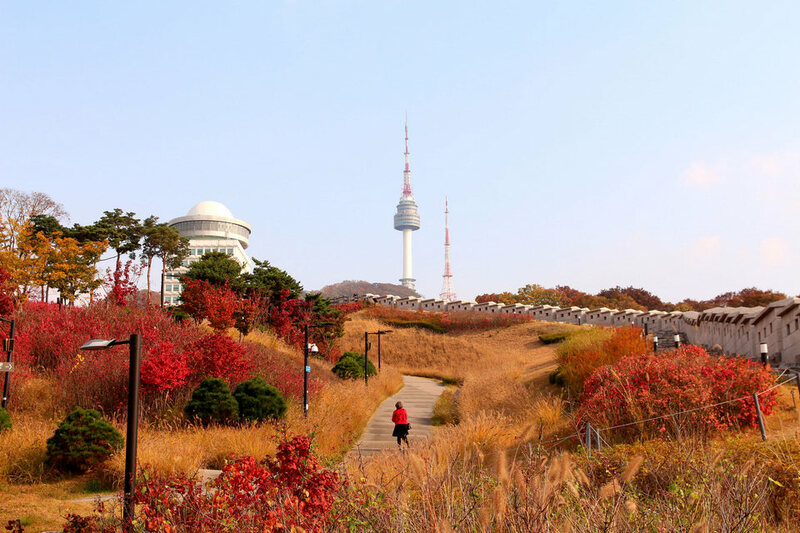 This is a popular spot for locals walks because from here, you can enjoy the panoramic view of the city. 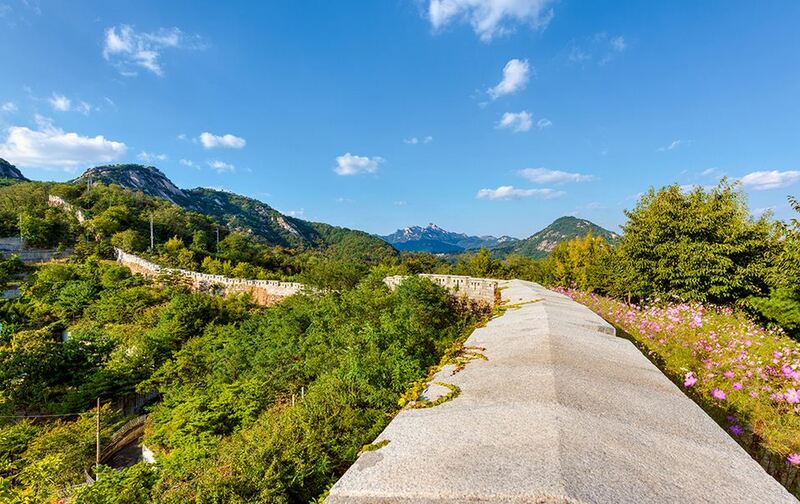 Please bring your identification papers because this is the military management area. 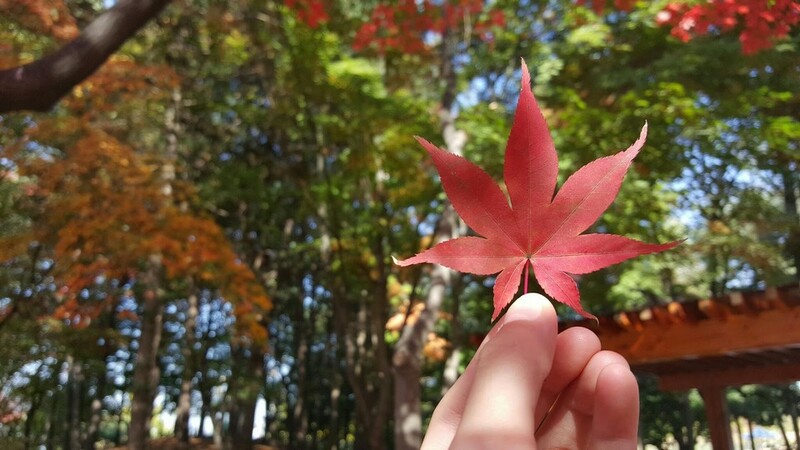 Also, photography is limited here. 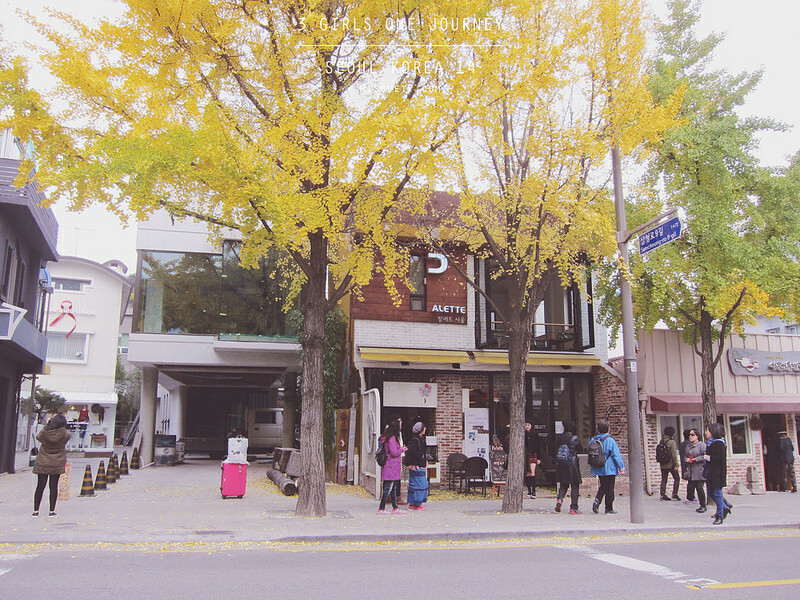 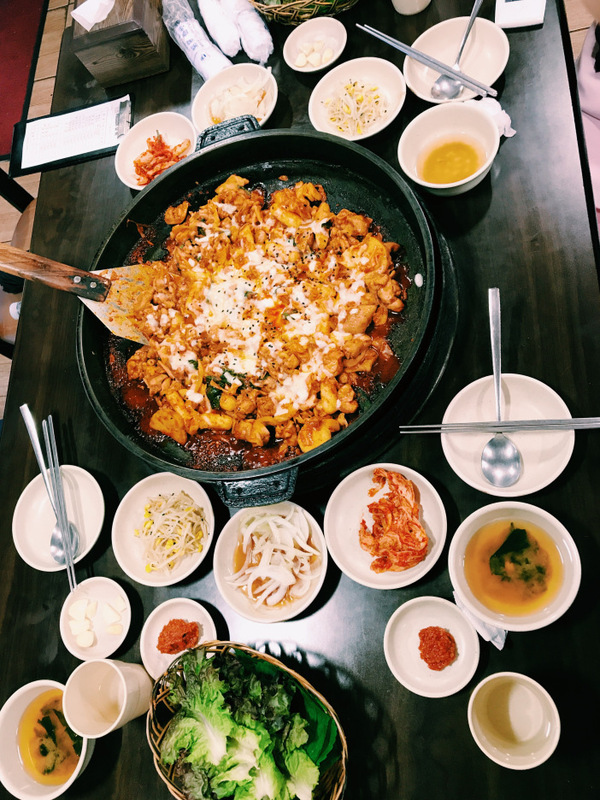 Attractions around: Bugaksan Mountain, Daelim Museum. 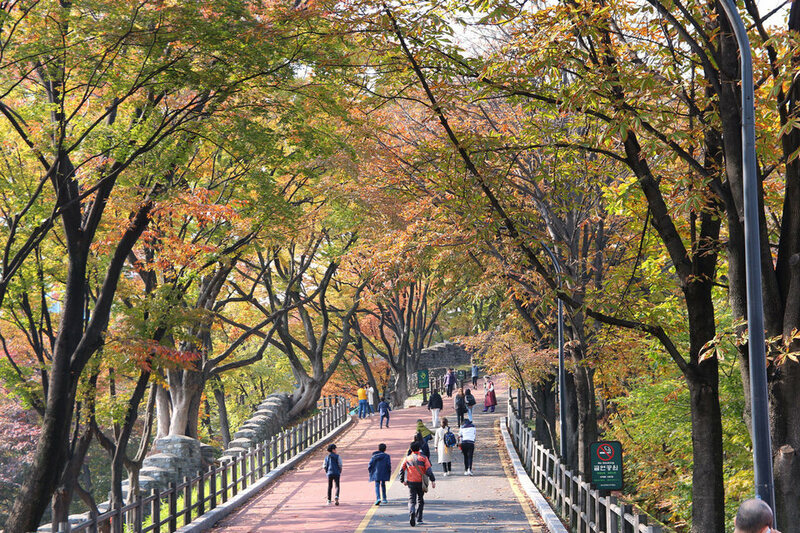 The road connecting Seoul forest to the Hangang river bank is also on the list of places that are chosen by many visitors. 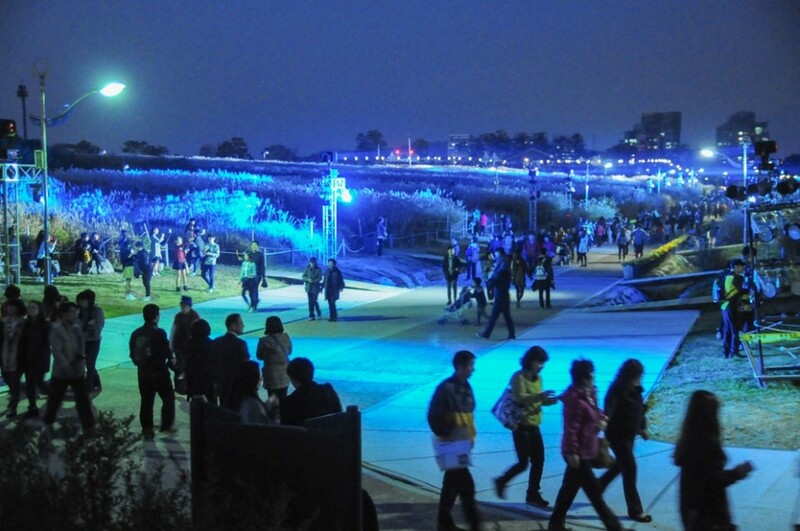 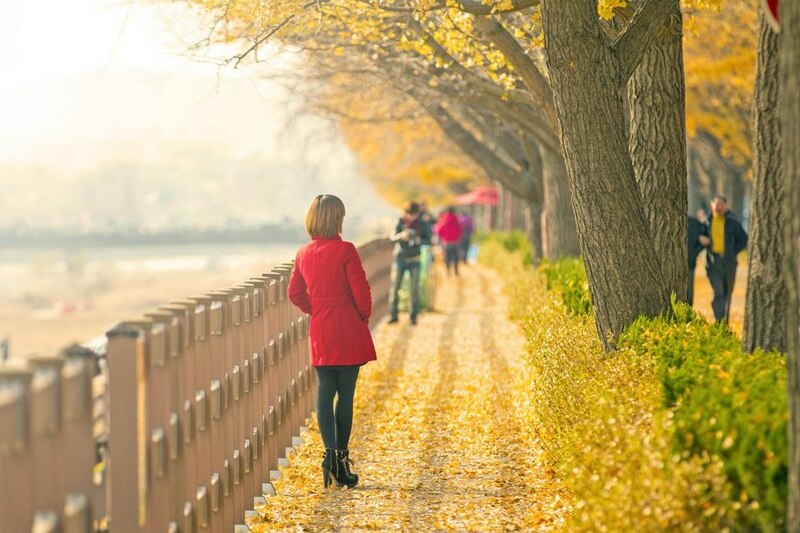 The road along the banks of the Hangang River with large geraniums and reeds gives visitors peace of mind. 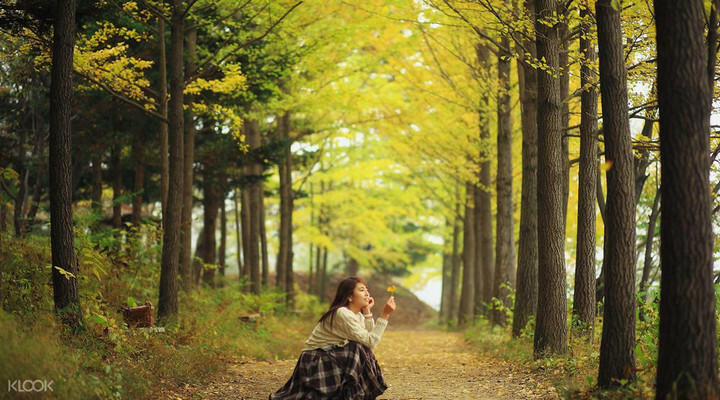 Come here, visitors feelings like being “showered” in the tranquil setting of the forest is turning to autumn, with a slight scent of wood. 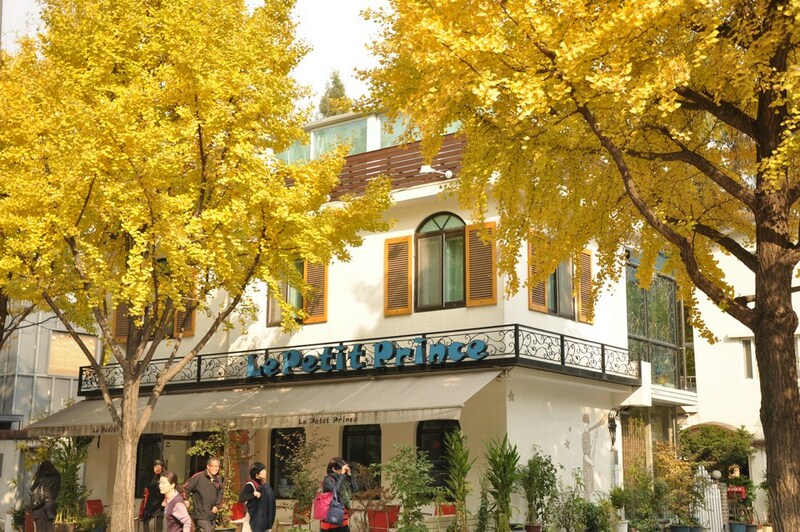 This is an area with many giant trees such as pines, yew, and ginkgo. 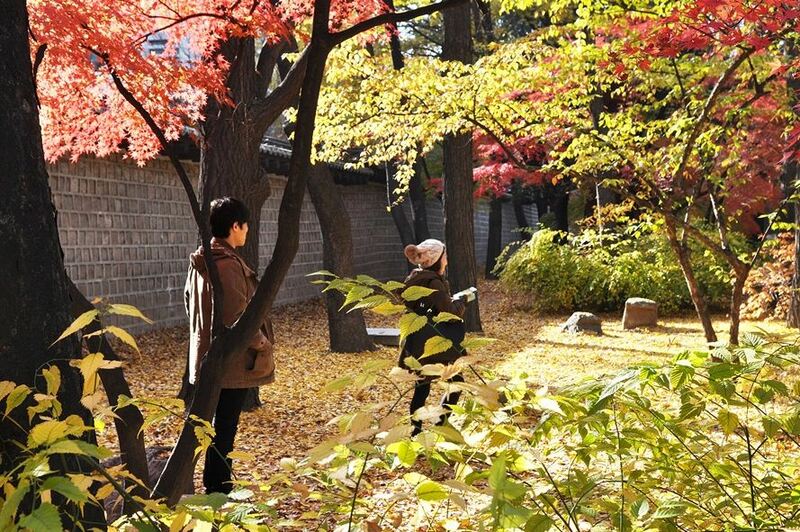 You can also see semi-wildlife animals in the zoo of the park. 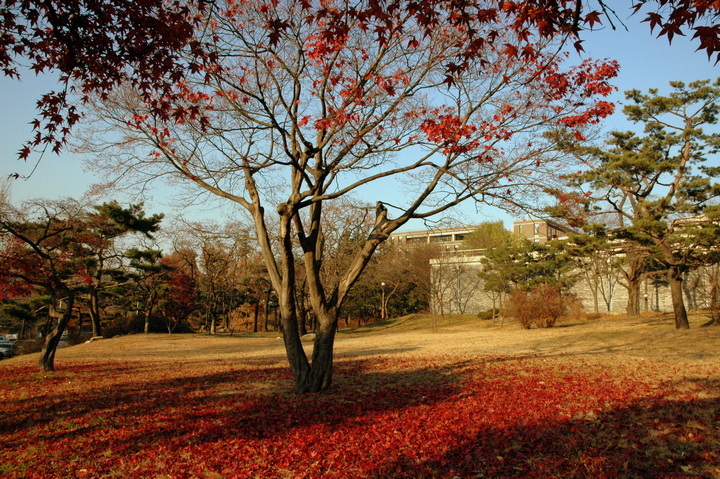 Attractions around: Seoul Zoo, Seoul Museum of Contemporary Art. 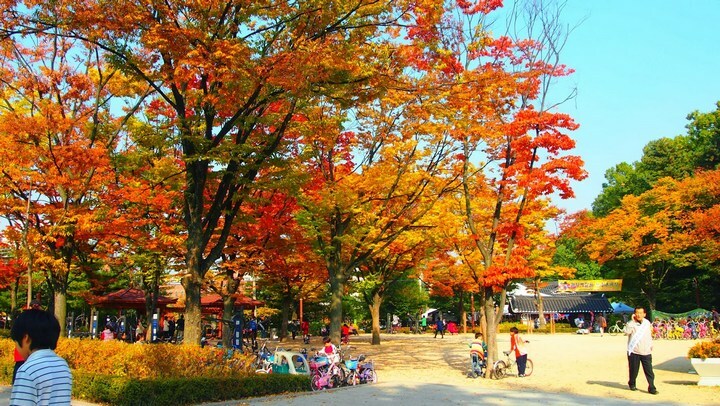 Nami Island: Nami Island autumn foliage 2018 forecast: Last week of October or first week of November. 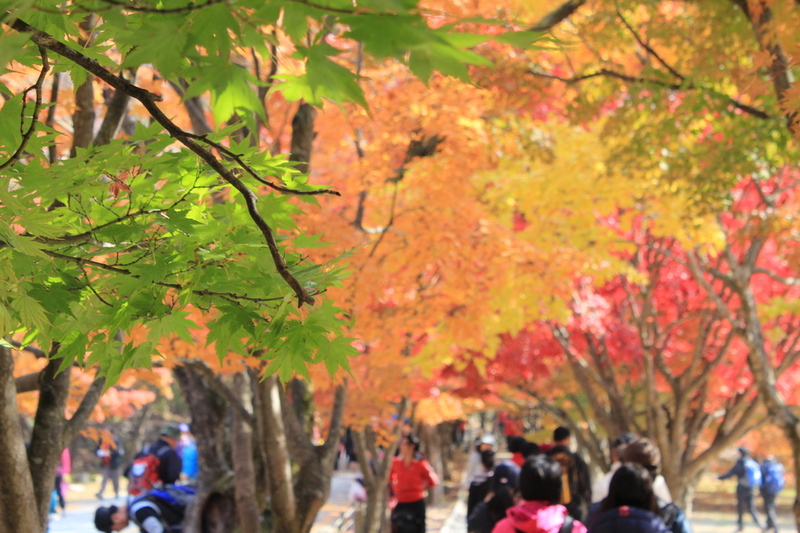 It would be a big mistake if you came to Korea in the fall but missed Nami Island. 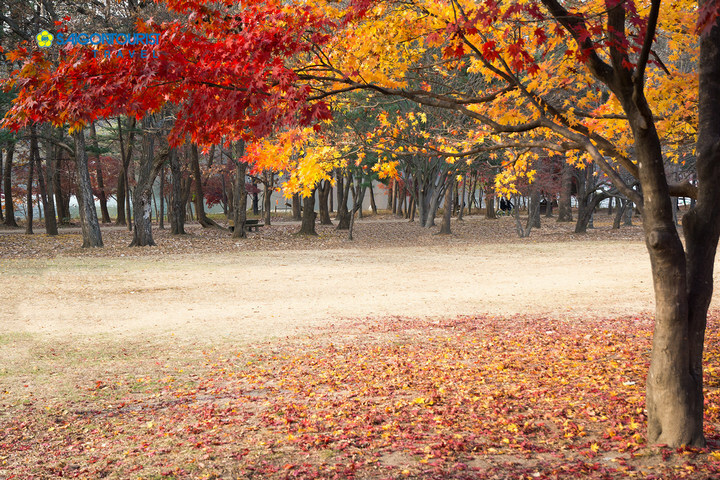 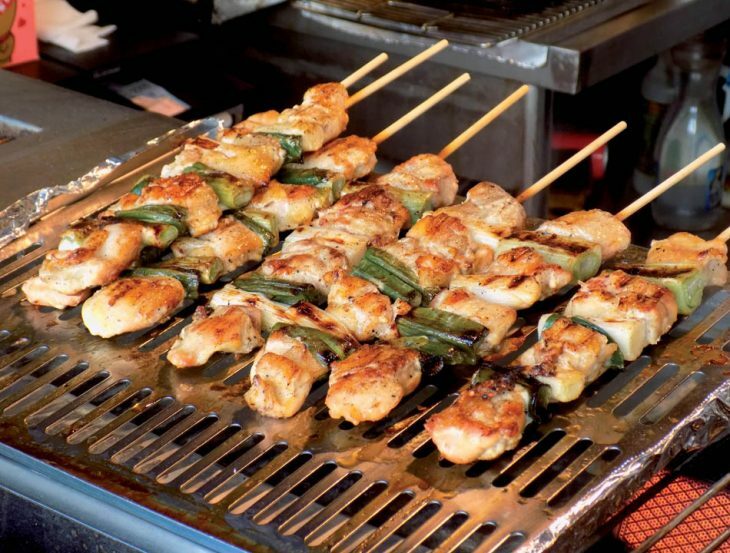 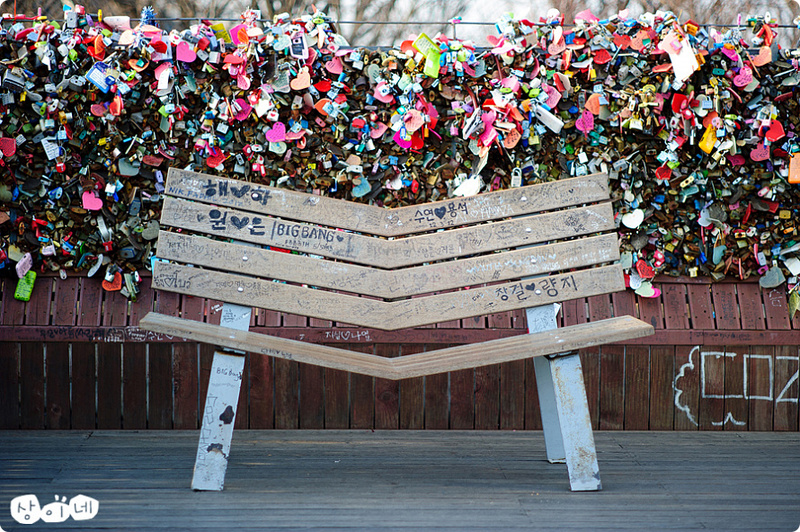 Nami Island is where couples often visit on weekends, enjoy simple but delicious food and relax. 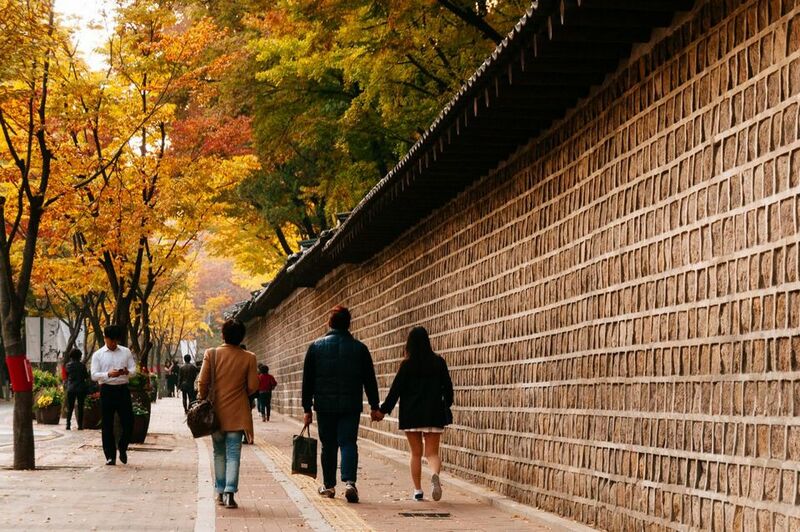 This is also the honeymoon destinations of many newlyweds in the land of kimchi. 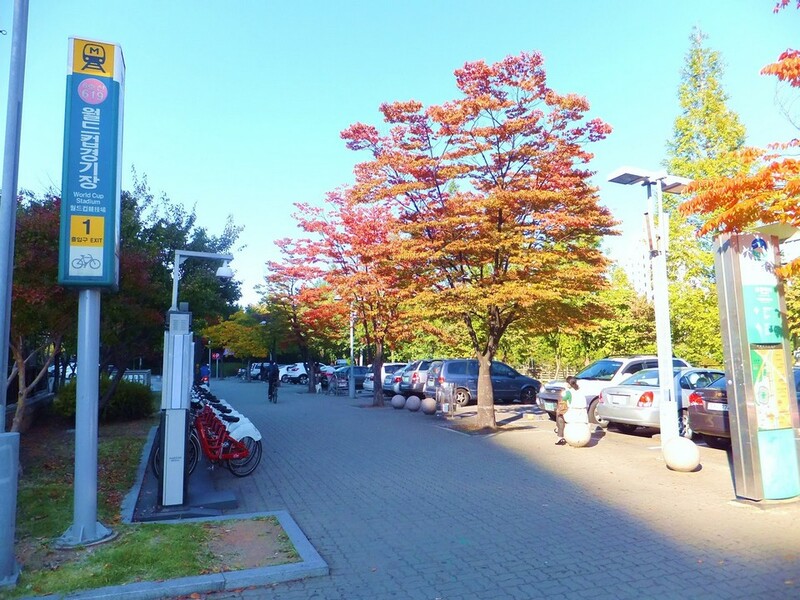 The trees in Nami will change color sooner than in other places in Korea so if you want to catch the fall of Korea soon there is no reason not to go to Nami! 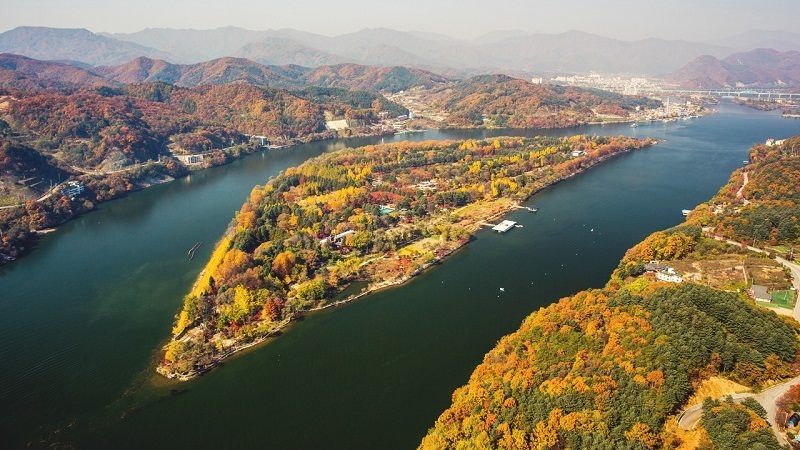 Credit: nami island autumn foliage 2018 forecast blog. 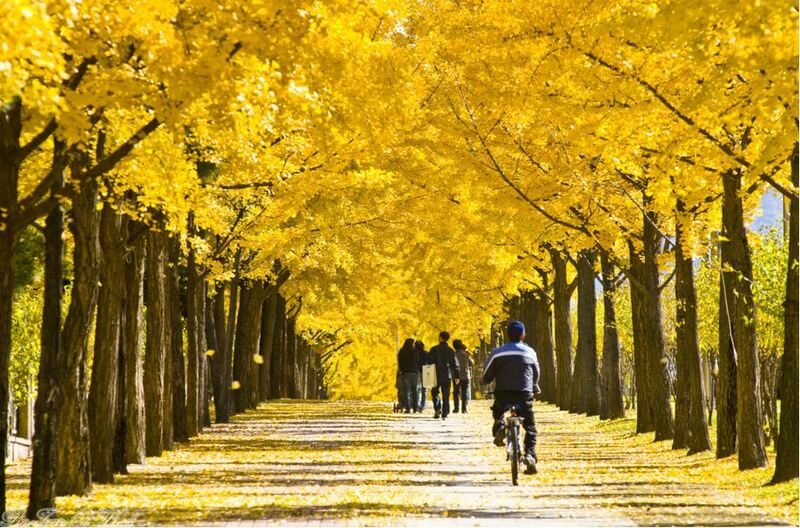 Autumn in Nami usually starts from mid-September to November, visitors can enjoy the beautiful foliage, “masterpiece” is created from the forest of ginkgo trees and forest of maple trees on the island of Nami. 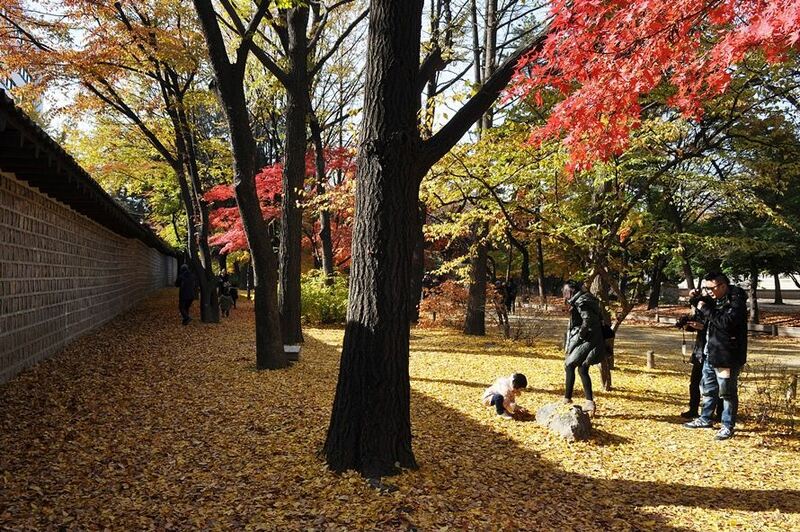 Around this time, the clear blue sky and dry weather, suitable for outdoor activities. 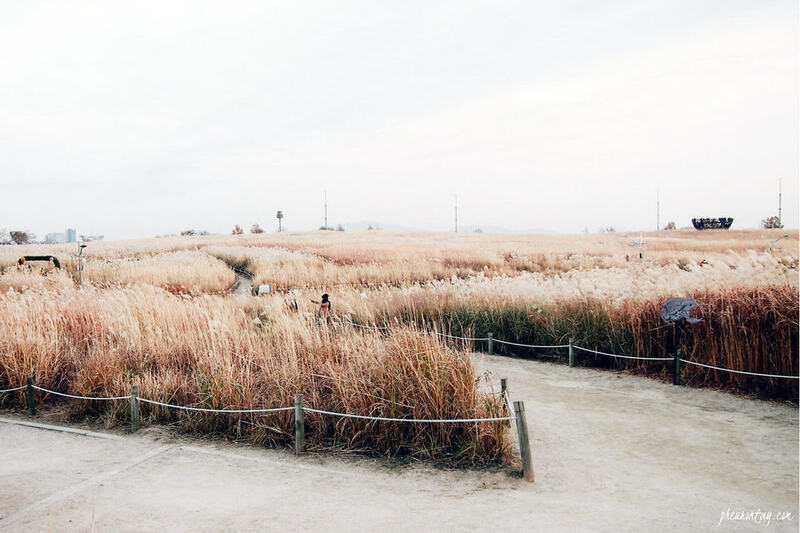 Nami does not lack the places that make the visitors fascinated. 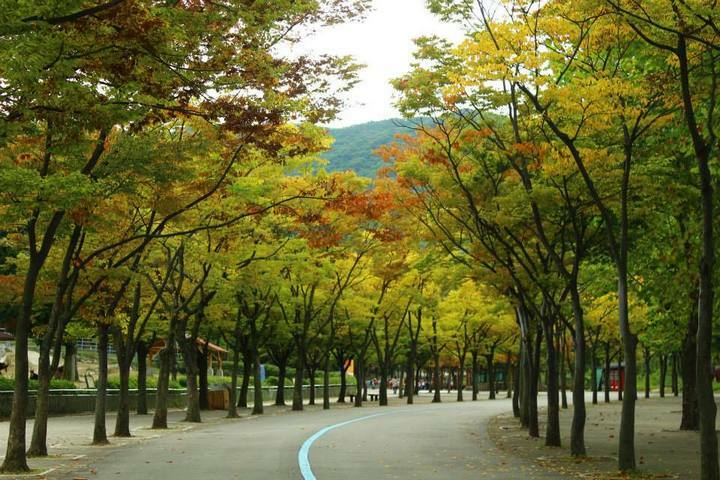 However, for the perfect trip, the central tree road is one of the places you can not miss when you set foot on Nami. 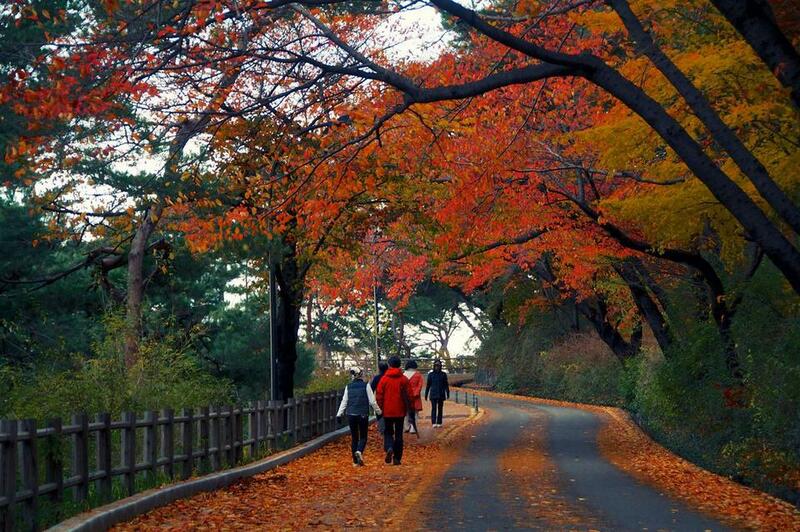 This beautiful road runs from the north of the island, starting at Nami Wharf to Central Square. 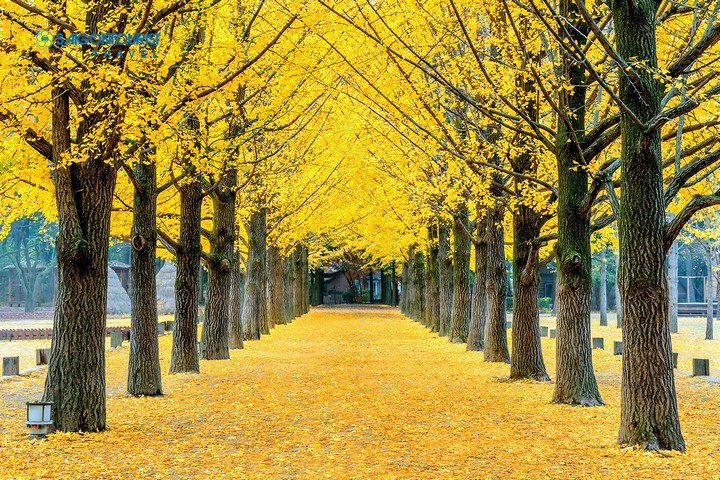 Row of yellow ginkgo tree in Nami Island. 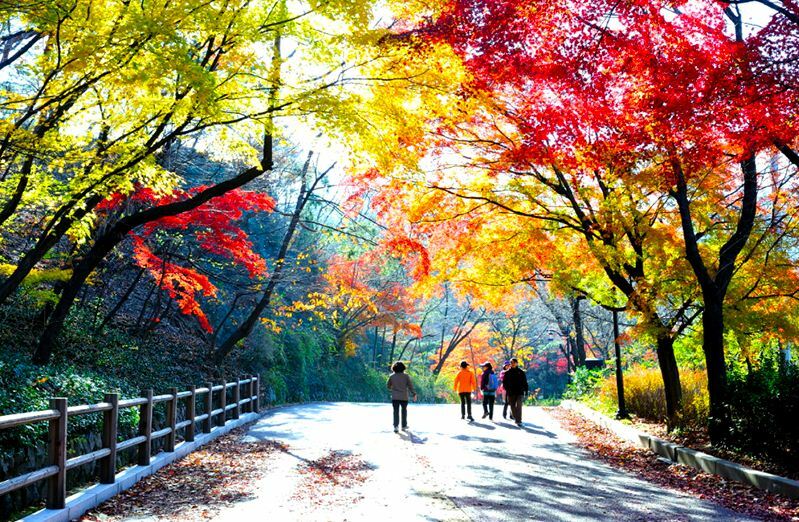 Credit: nami island autumn foliage 2018 forecast blog. 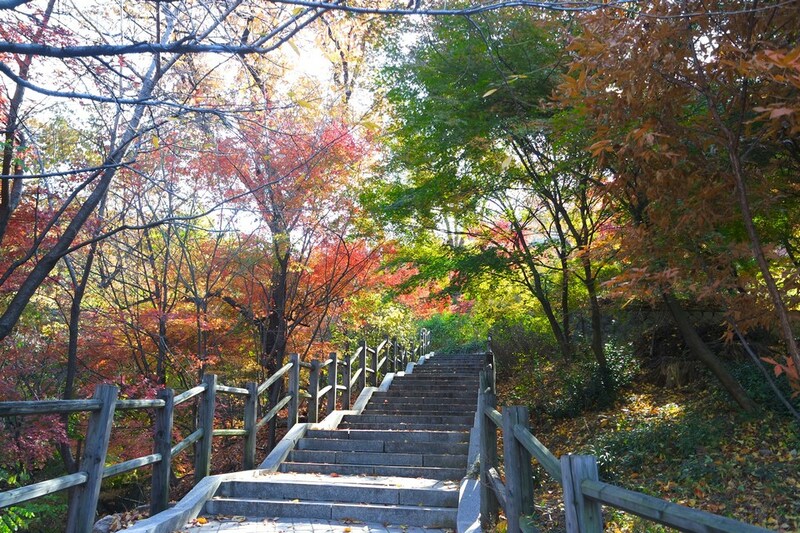 A favorite place is Gongsaengwon Garden. 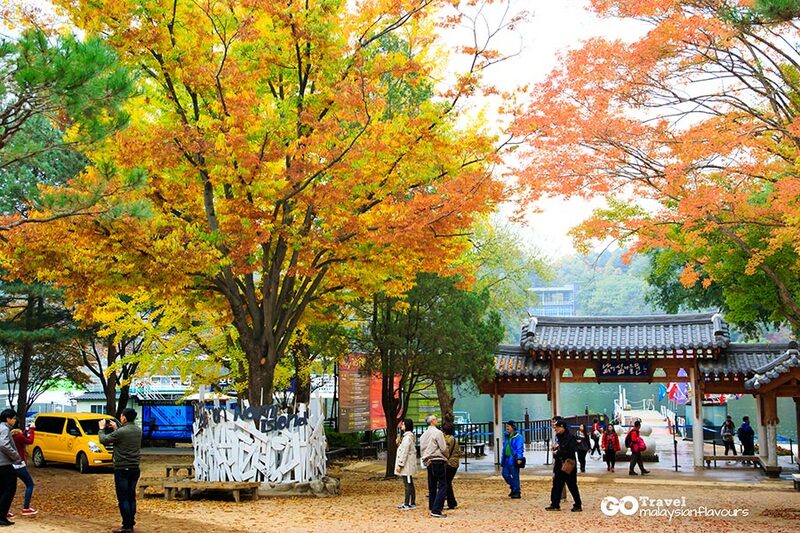 Here, you can find the statue of the main characters in Winter Sonata movie – one of the main symbols of Nami Island. 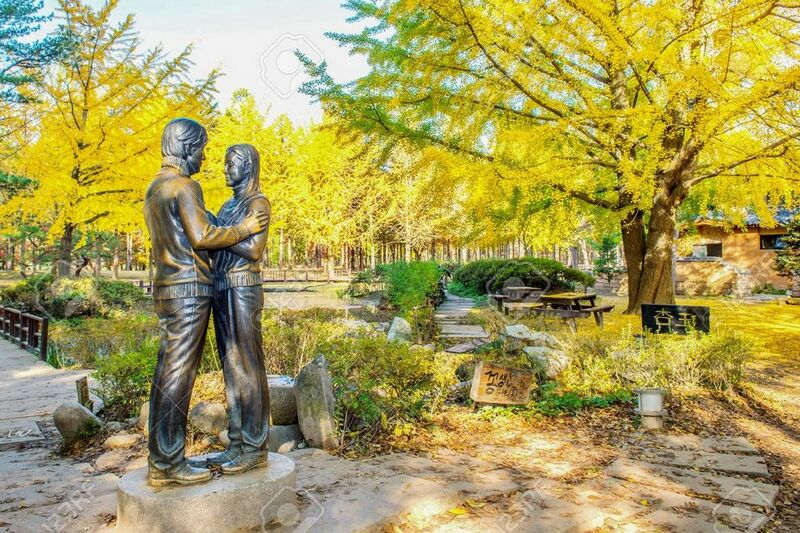 This is an ideal place for couples to take pictures. 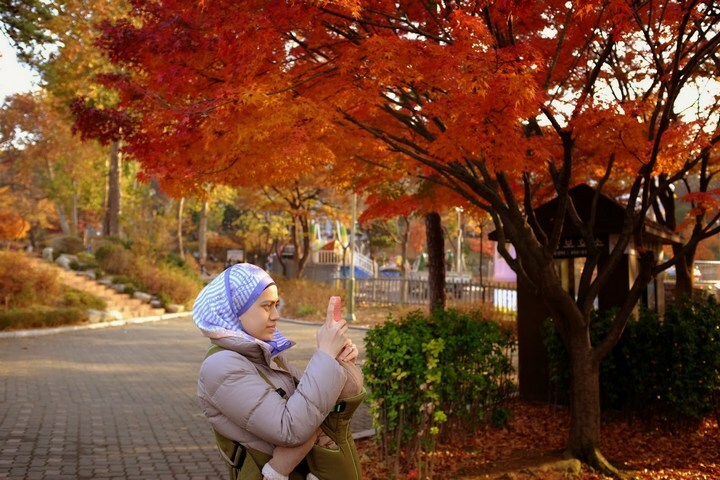 Famous Statue in autumn of Nami Island. 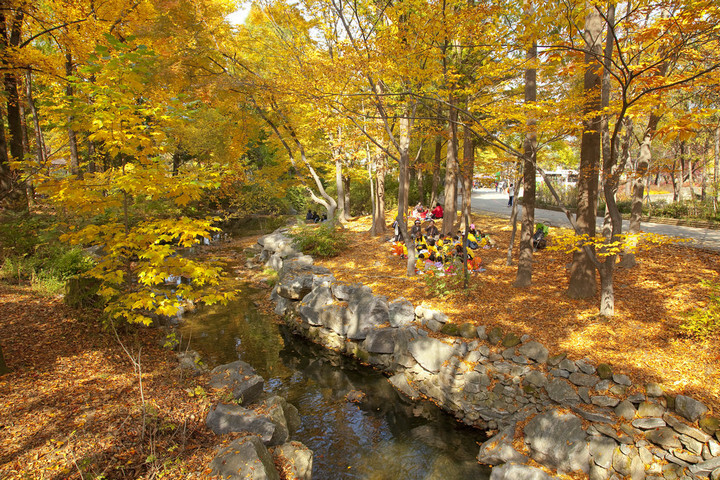 To reach Nami, you should depart from Seoul, because Nami is about 90 minutes away from Seoul, suitable for day trips. 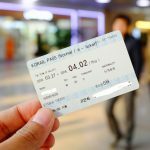 If you use regular public transport, the trip will be a little inconvenient because the travel time can last up to 2 hours or more. 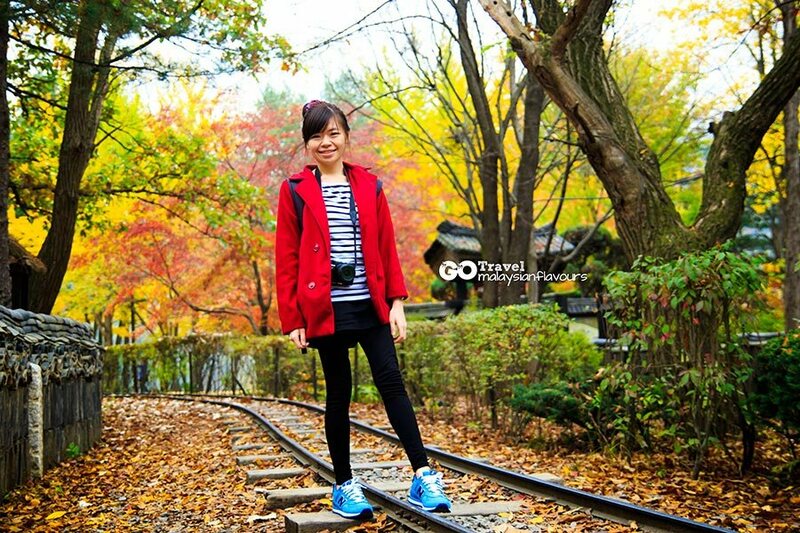 Therefore, it is better to use a shuttle bus or take a tour. 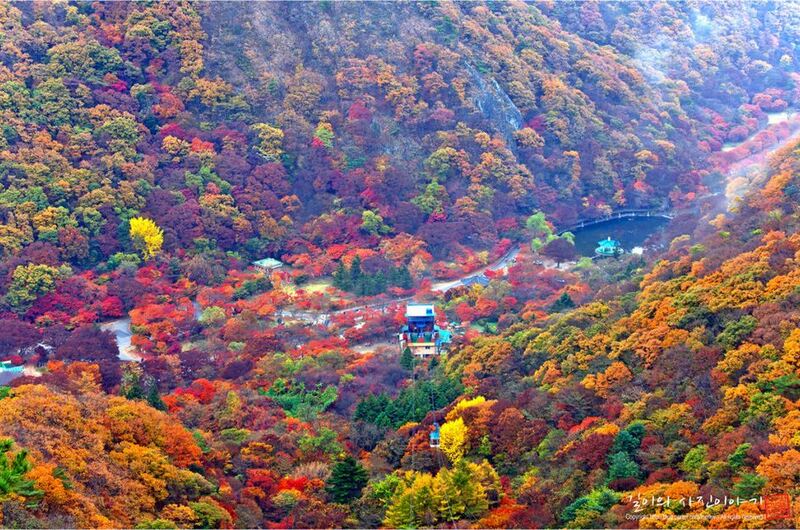 The most beautiful autumn is on the mountains. 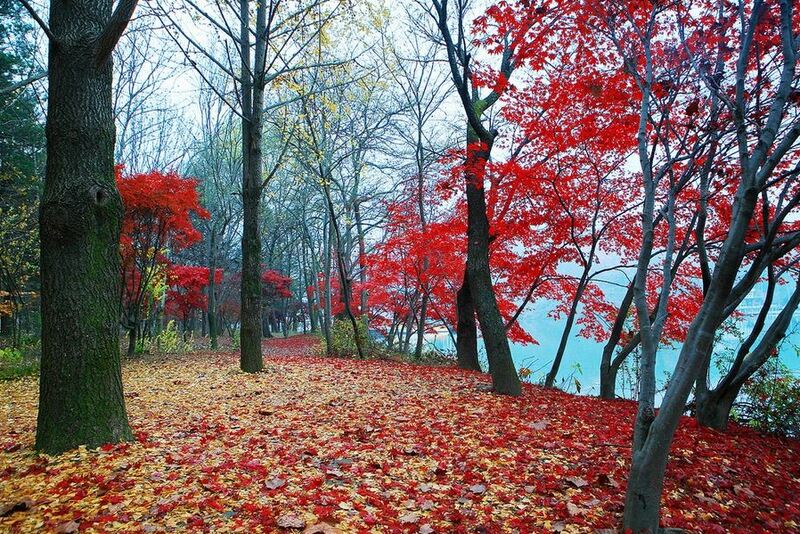 Imagine that you climb to the top of the mountain and look down on the carpet of red and yellow leaves of the endless forests or somewhere along the banks of streams, the leaves patches floating on the water. Any mountain or forest in Korea will bring you the breath of autumn, but the 5 national parks listed below have gone into the travel books of Korea and are known as the most beautiful national parks must visit in the fall.